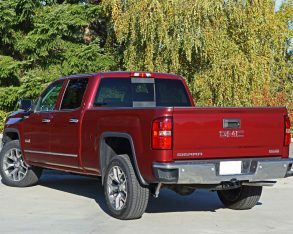 been understandable being that some models in the truck and SUV brand’s lineup are very similar in design and purpose to models sold under Chevrolet’s bowtie badge, such as this Sierra 1500 that’s often referred to as the fraternal twin of Chevy’s Silverado, but to my eyes the GMC version has almost always been the better looking of the two. 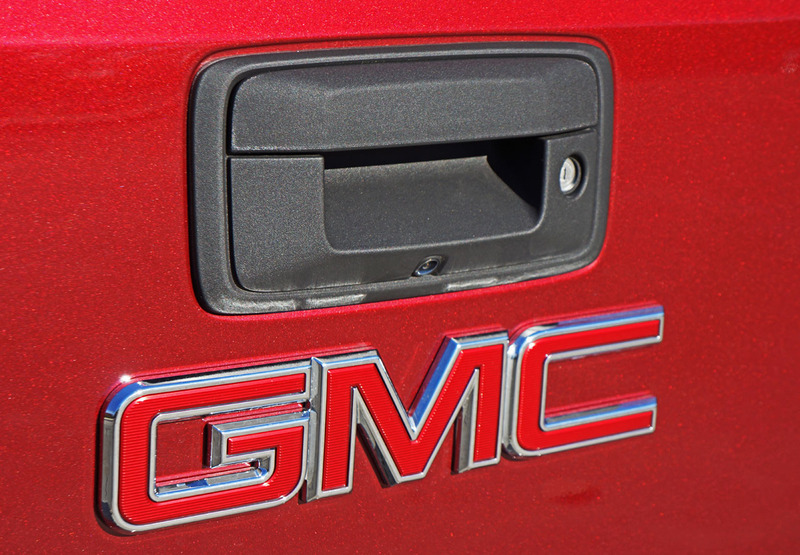 Such was the case with the 2014 redesign that saw both trucks completely reworked from the ground up. 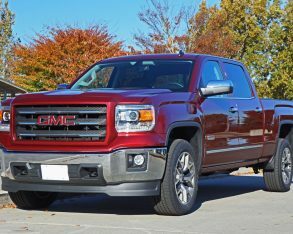 The new truck was made stronger and tougher yet more refined looking, not to mention a lot more refined inside, and the result has been nothing less than unanimous praise by professional scribes like yours truly along with kudos from the model’s hundreds of thousands of devotees. 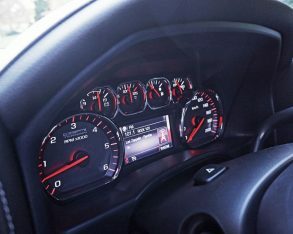 one of the best, leaving the two imports in the class very far behind while now rubbing shoulders with Ford’s redesigned F-150 and even Ram’s impressive 1500 interior. 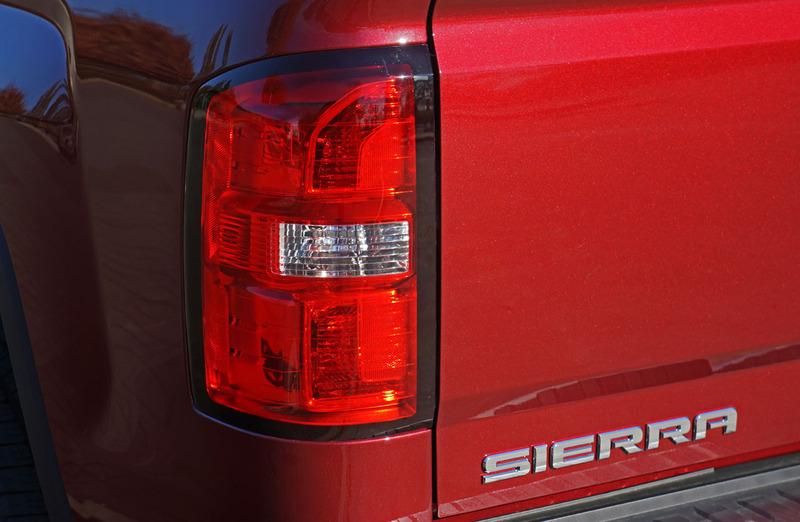 The new Sierra’s design and execution are excellent, especially noticeable in my tester’s mid-grade SLE trim. 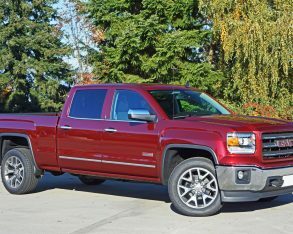 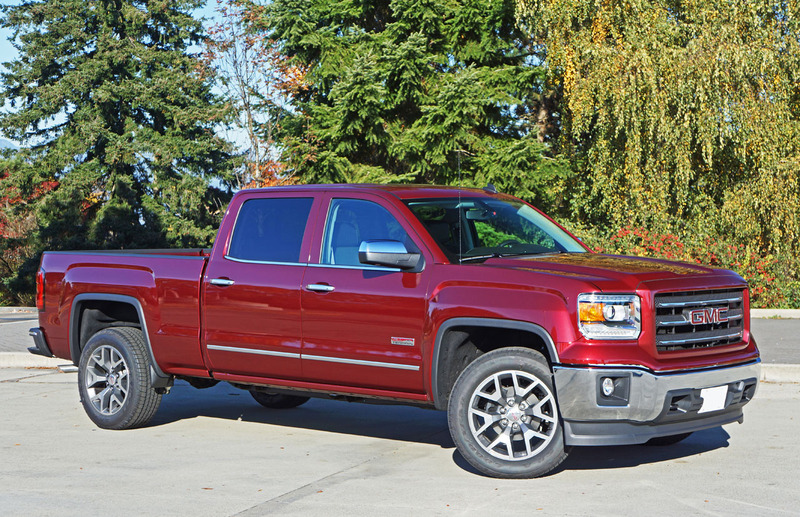 As you may already know, the Sierra 1500 can also be had in base and near top-line SLT trim as well as top-tier Denali guise, the latter qualifying it for premium pickup truck status amongst the contractor and cowboy crowd (and cowgirls too). 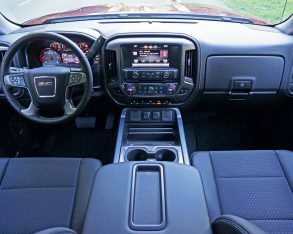 You can dress up the SLT with leather and other premium touches if its understated styling is more to your liking and slightly less expensive so-equipped pricing more acceptable to your budget, but I happen to like the way GMC kitted out this particular SLE model. 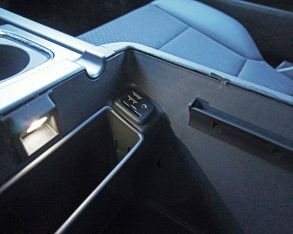 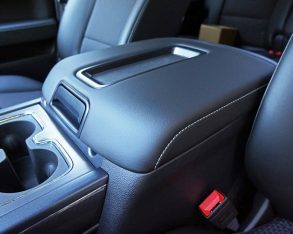 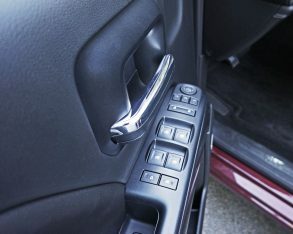 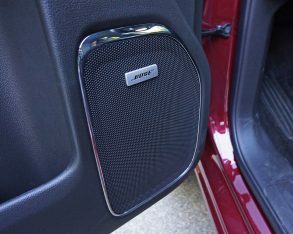 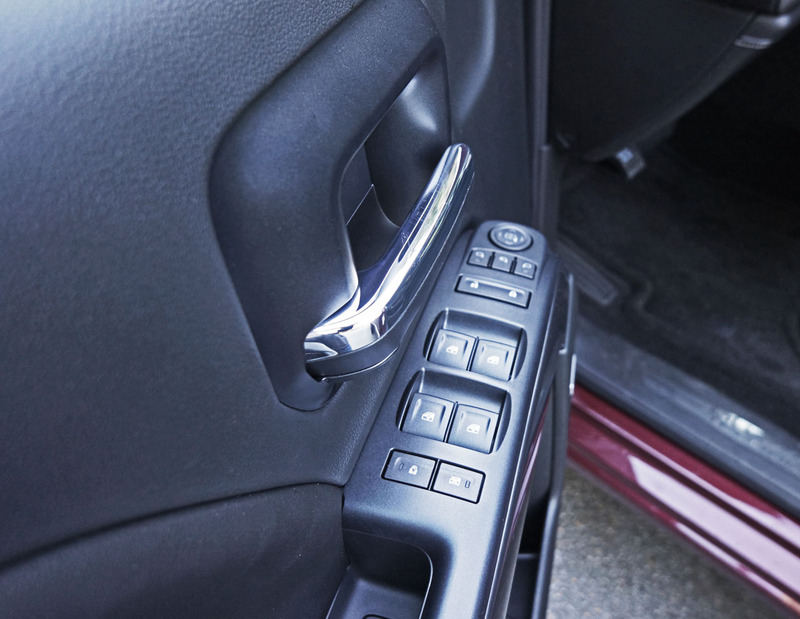 the base model’s rubberized flooring and more minimalistic dash layout, the SLE gets premium-level soft-touch surfaces on the front door uppers where elbows often rest and door panel inserts where sound absorption is critical, plus the expected padded armrests on the doors and overtop the centre storage bin. 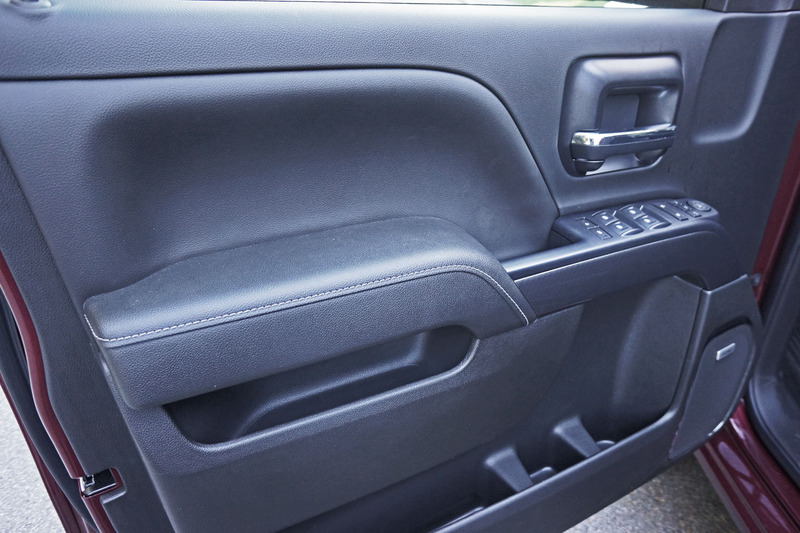 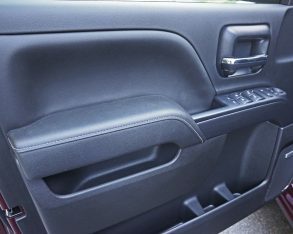 Soft synthetic surfacing improves the look and sound-absorptive qualities of the dash top too, wrapping right down to the lower instrument panel as well as over the two glove box doors, which as you may have guessed doesn’t happen in base trim. 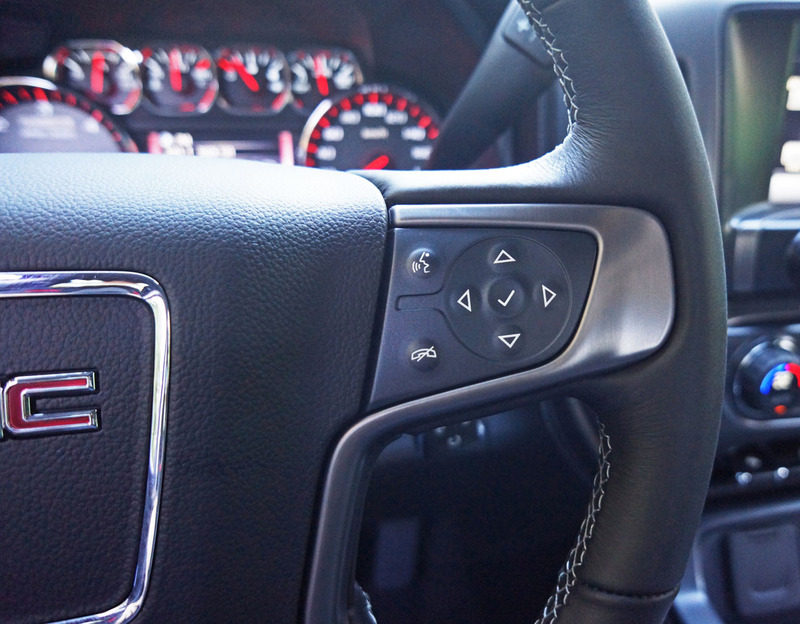 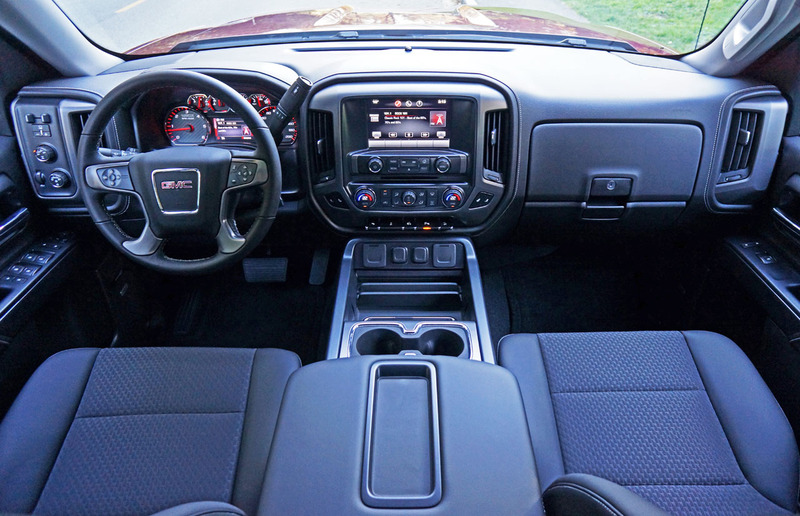 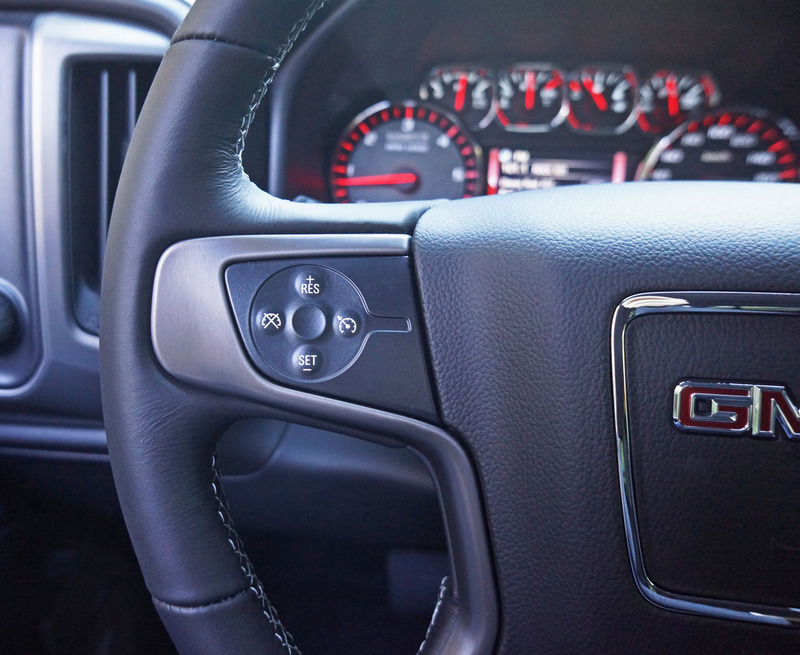 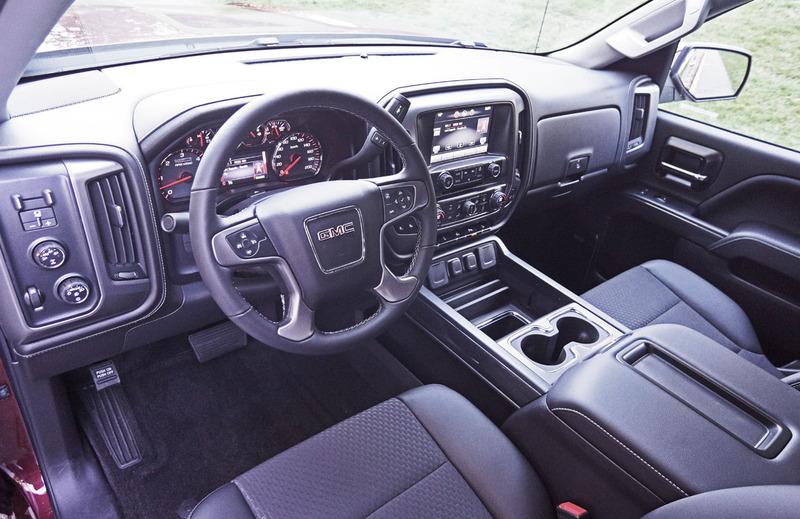 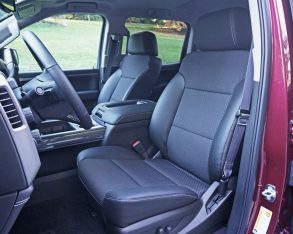 Also impressive, GMC has stitched together all the soft leather-like surfaces with attractive off-white thread that matches the same treatment on the leather-wrapped steering wheel and optional leatherette-bolstered bucket seats. 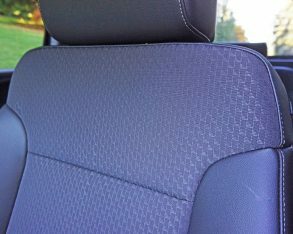 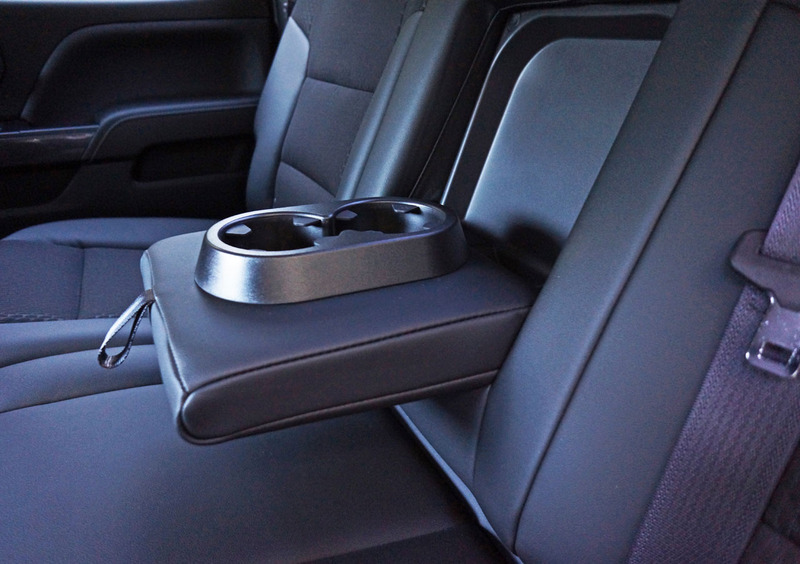 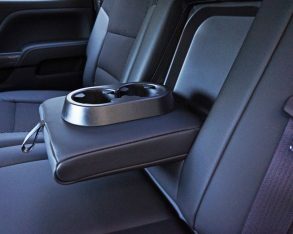 The seats get attractive fabric inserts too, more comfortable than leather during extremely cold and hot conditions. 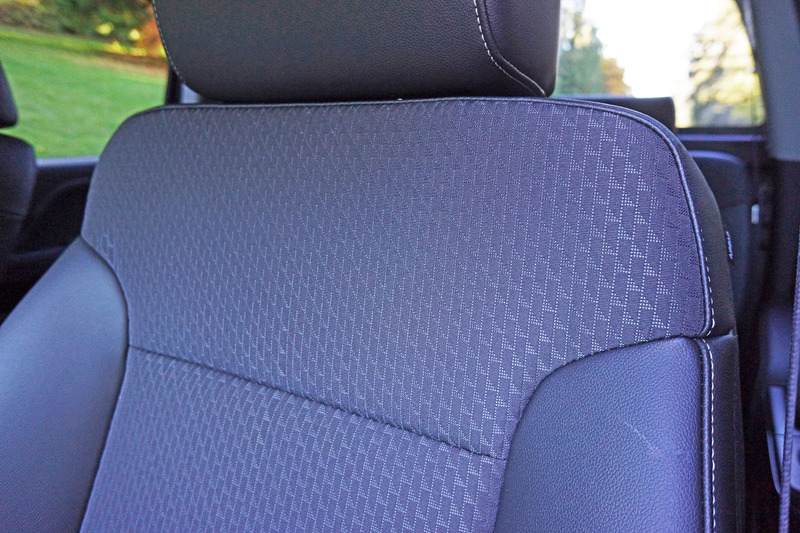 Additionally, a nice woven headliner material adds to the truck’s upscale ambiance. 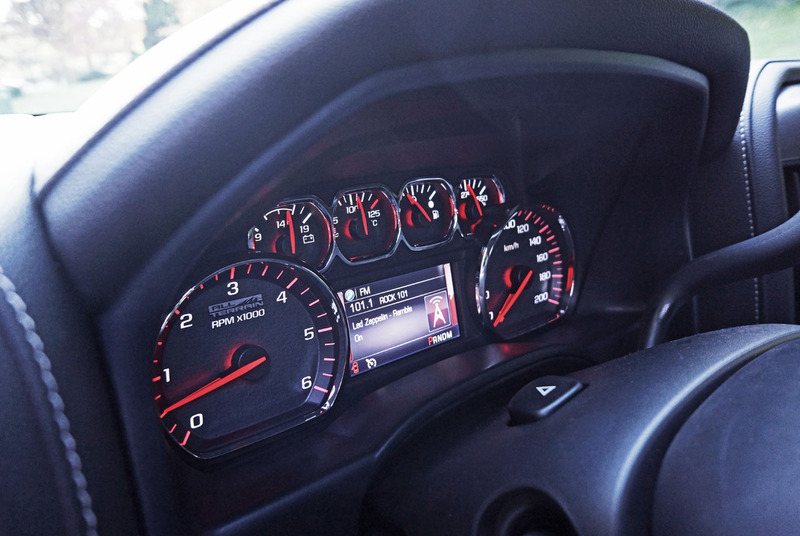 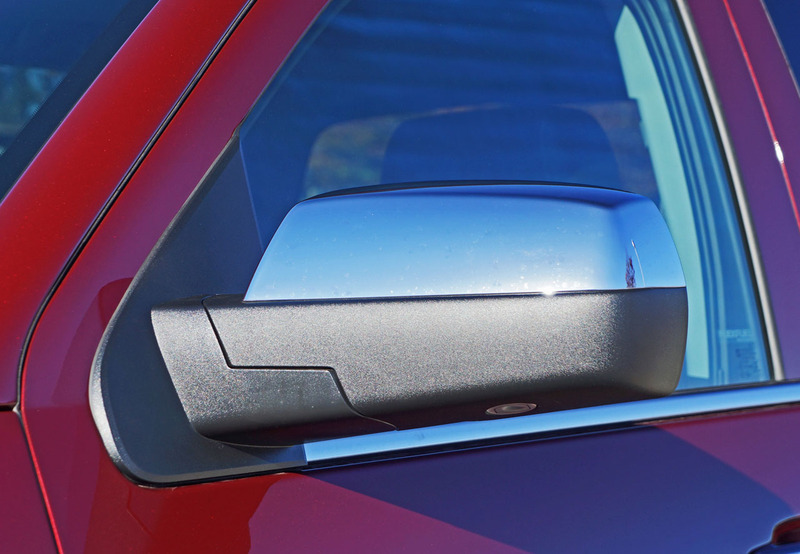 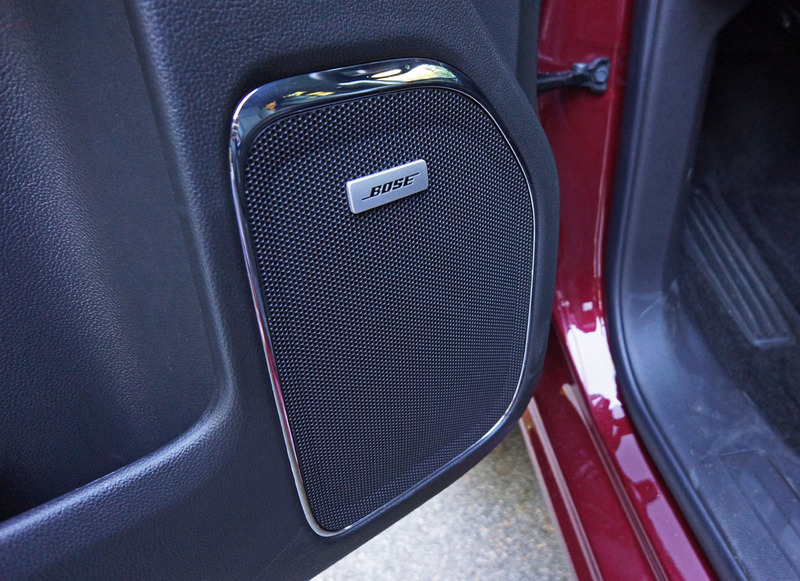 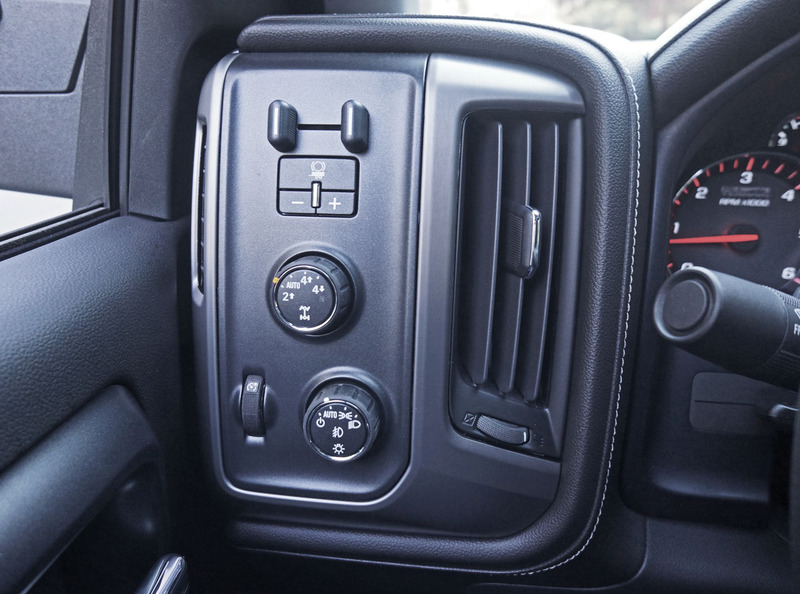 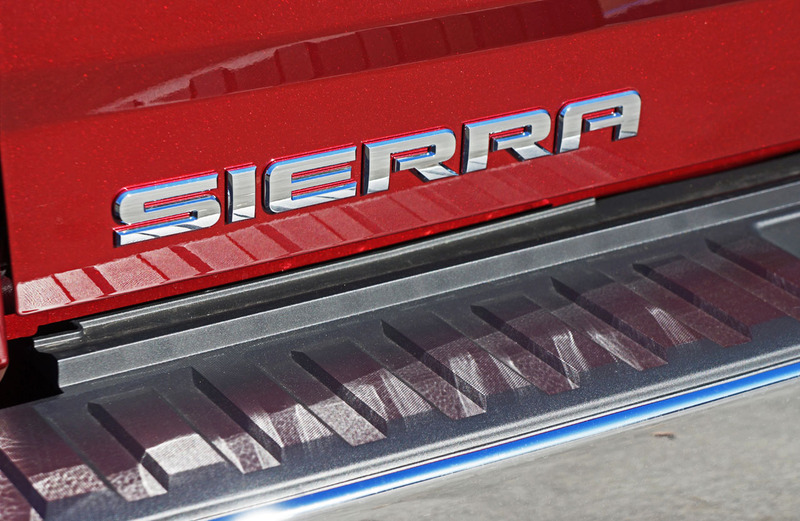 an impressive assortment of high-resolution electronic interfaces adds to the Sierra SLE’s premium-like air. 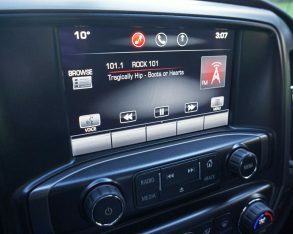 I found the eight-inch full-colour high-resolution IntelliLink touchscreen infotainment system especially user-friendly, the graphics superb, and standard OnStar 4G LTE with Wi-Fi hotspot capability a real bonus, while the optional Bose audio upgrade, building on the standard AM/FM/CD/MP3 display audio system, made some of my favourite tunes sound fabulous. 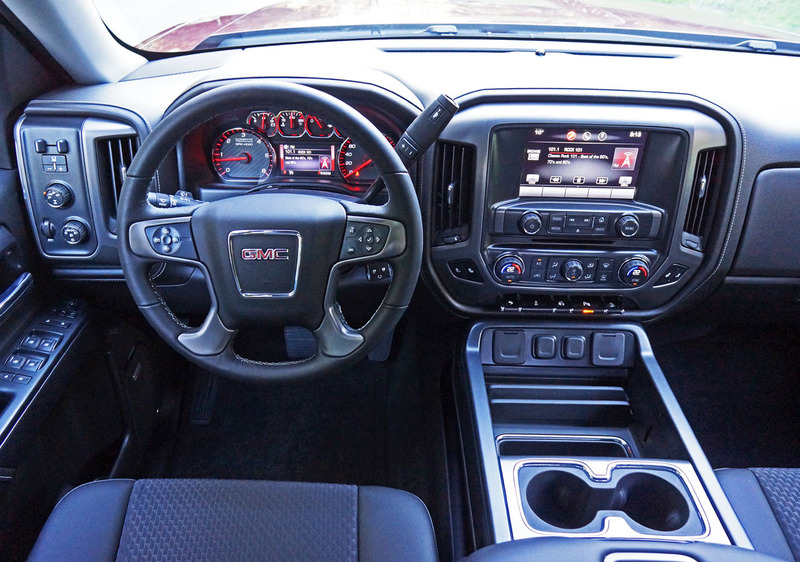 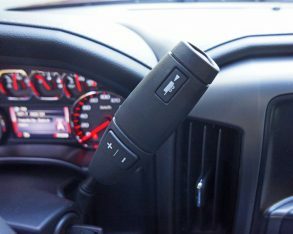 Steering wheel controls are always appreciated when searching through stations, especially with myriad talk and musical options on the satellite radio-equipped Sierra. 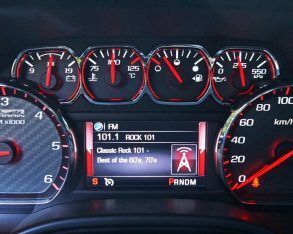 While flicking my way to Lithium, a personal favourite, I couldn’t help but stop at 70s on 7 for a moment, as The Eagles’ Take it Easy seemed ideal for this truck. 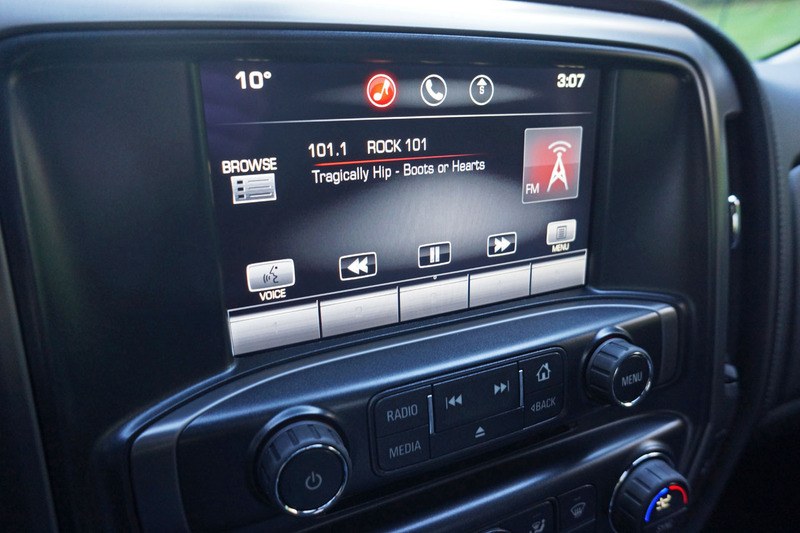 Reaching back to the past sent me over to a local classic rock station on the FM dial where Canadian rockers The Tragically Hip kicked it up a notch. 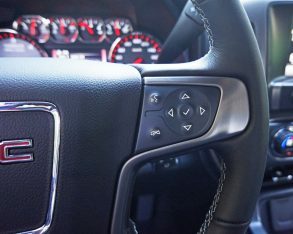 & Connections Plan with Turn-by-Turn Navigation plus OnStar RemoteLink. 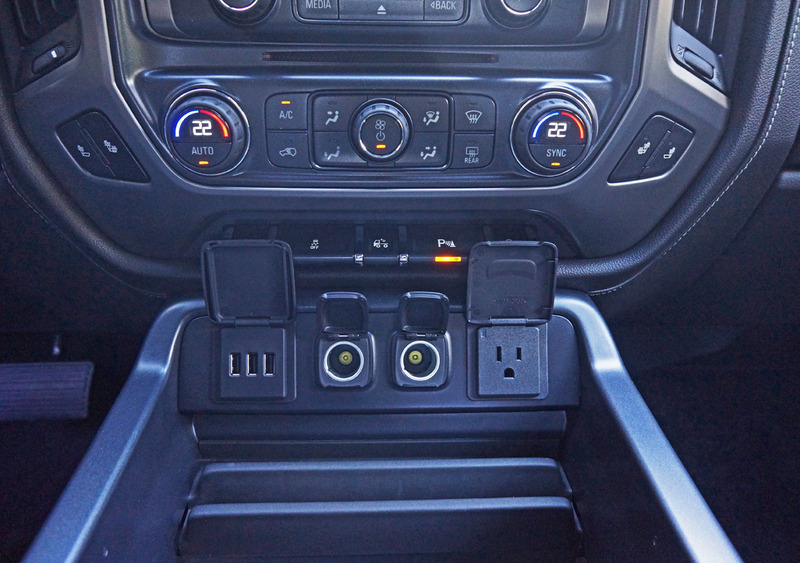 Above the row of ports and plug-ins, and then on top of a row of secondary toggles squeezed in between for actuating the optional power adjustable pedals, dual LED lights for the cargo box, rear parking sonar, and grade control, sits GM’s superb dual-zone automatic climate control system, one of the nicest designs in the segment and as user-friendly as any. 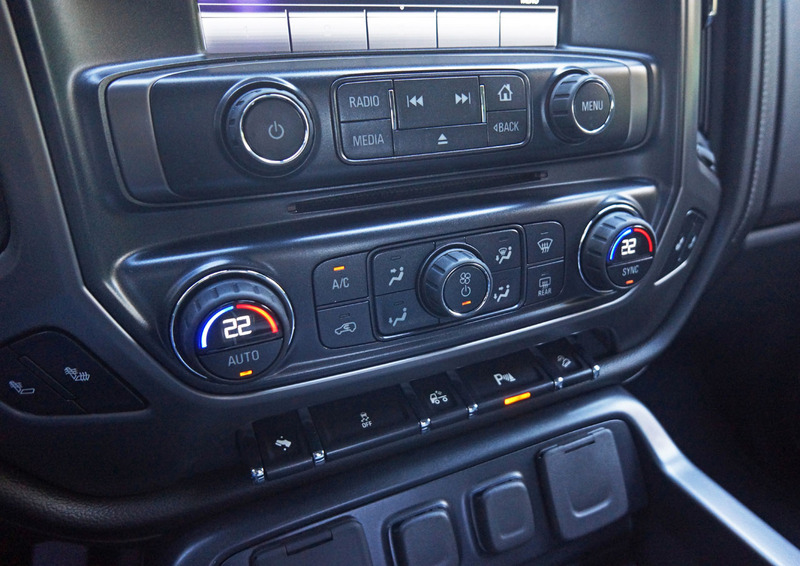 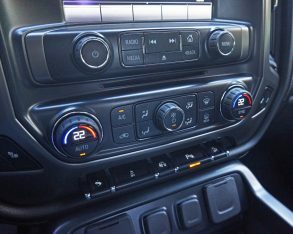 I especially like how the digital temperature settings are displayed within the rubber-rimmed right and left rotating knobs, an efficiently packaged setup that looks great. 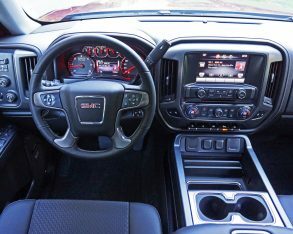 the SLE’s sporty interior, while the 4.2-inch high-resolution full-colour multi-information screen set amongst the dials was simple to use and fully featured with access to driver personalization features, oil life monitoring, tire pressure monitoring, warning messages, and advanced vehicle information. 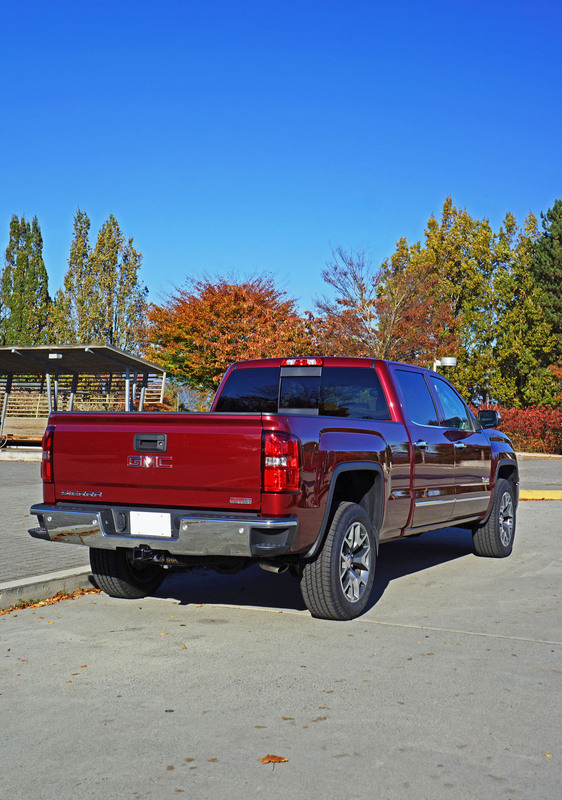 with LED signature lighting, fog lamps, chrome bodyside mouldings, chrome mirror caps, chrome door handles, upgraded alloy wheels, underbody shielding for the transfer case, the Z71 Off-Road suspension with Rancho shocks and a trailering package. 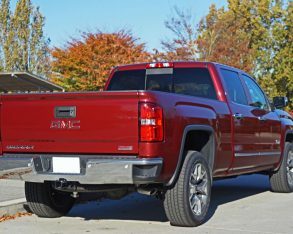 The All Terrain Package normally comes with colour-keyed bumpers front and rear, the back bumper incorporating GM’s innovative CornerSteps for easy access to the cargo box while the tailgate is down, but the person who optioned out my tester chose the All Terrain Chrome Bumper Package for a more traditional pickup truck look. 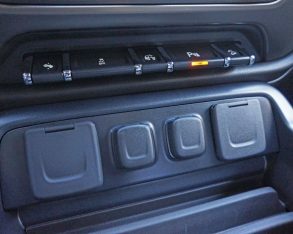 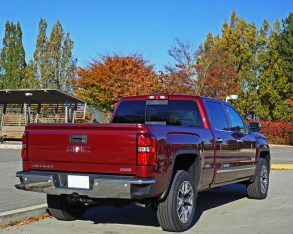 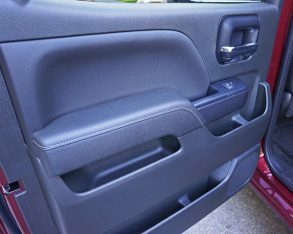 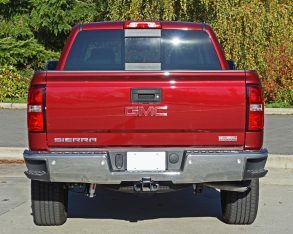 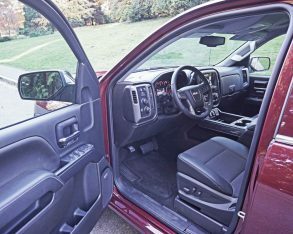 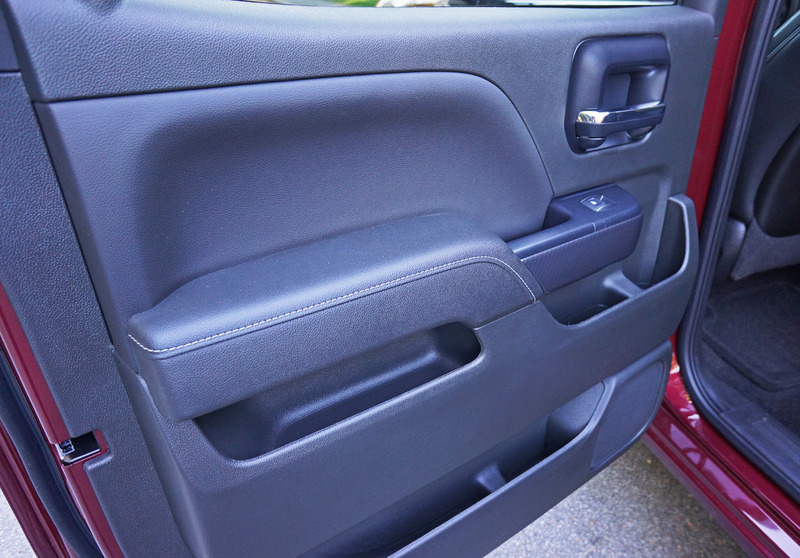 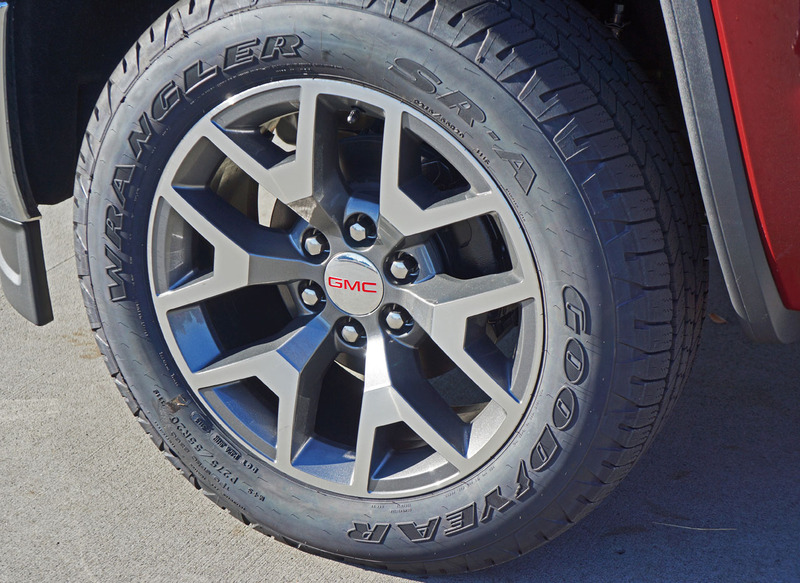 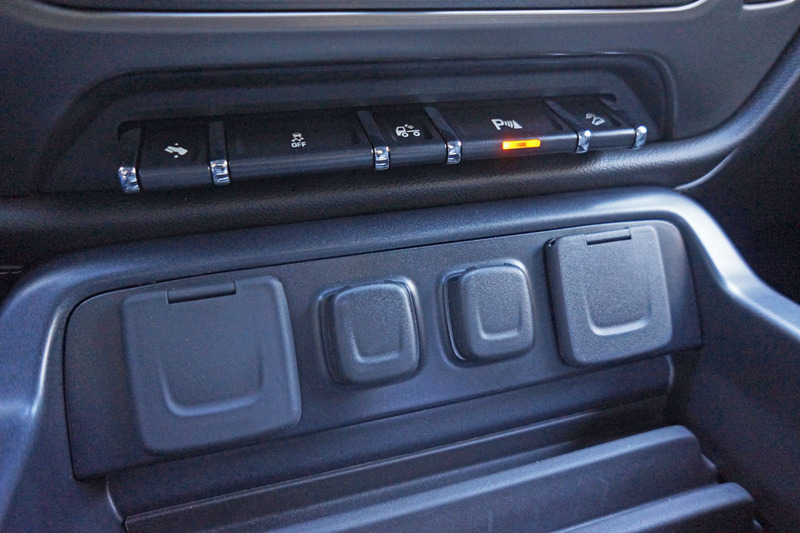 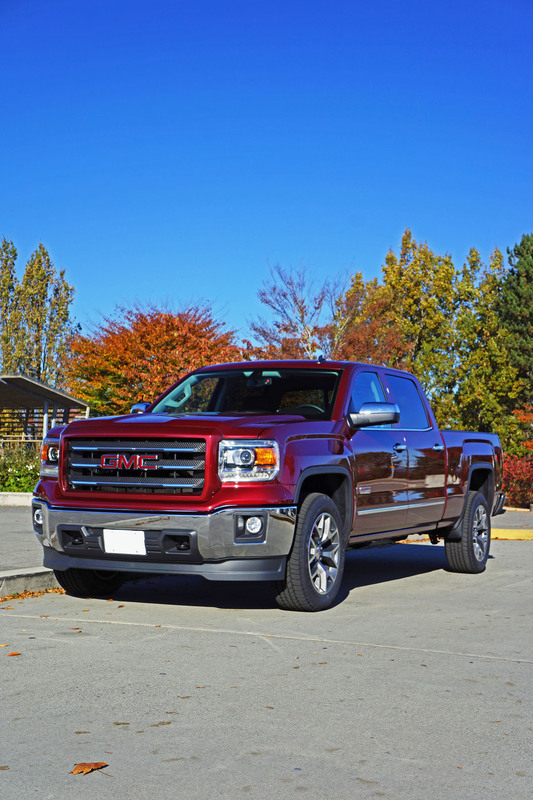 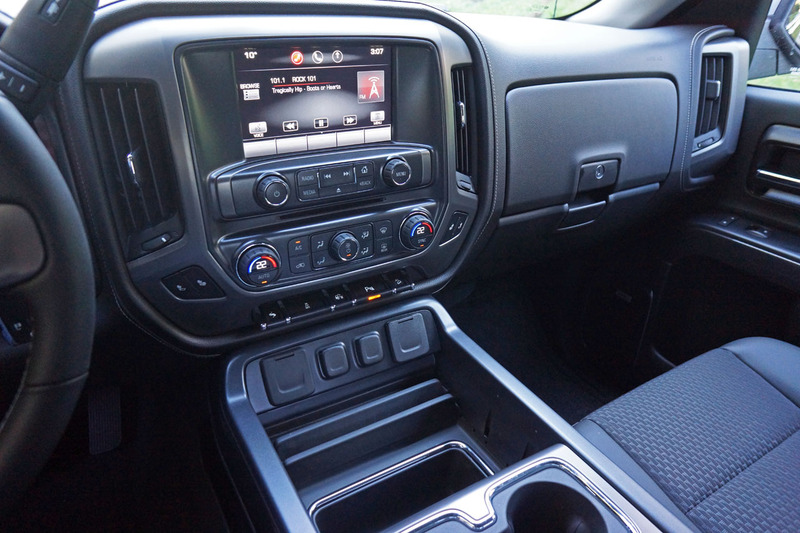 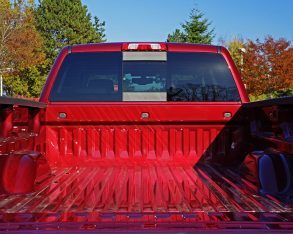 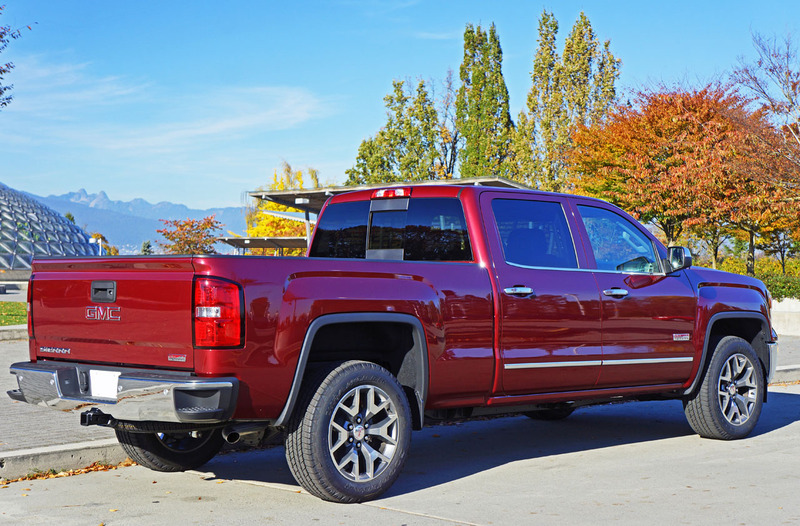 In addition to the CornerSteps, GMC also offers retractable assist steps for accessing the cargo box from the side, while my tester also featured a nice set of rectangular chromed side steps for easy access to the cab. 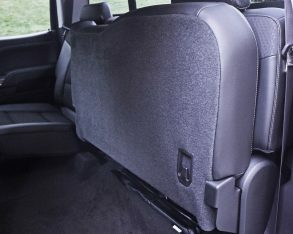 bench with a fold-down centre armrest, you also get a nice big centre console with removable cupholders and storage galore. 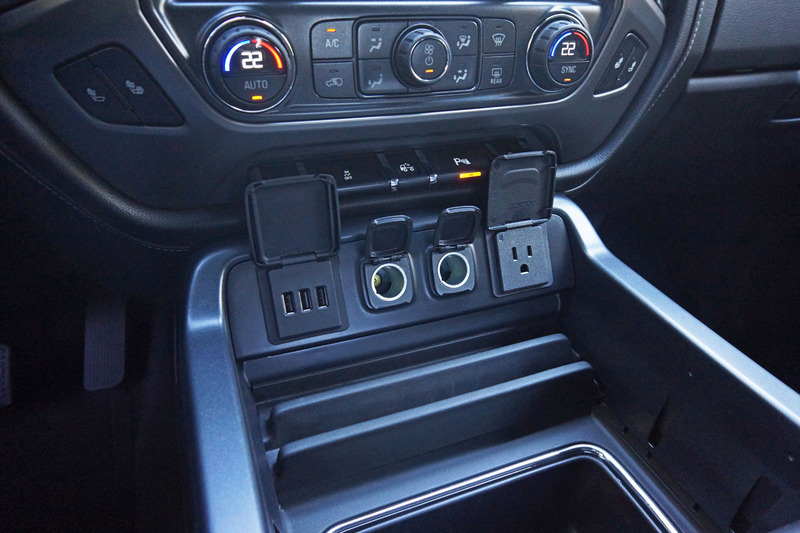 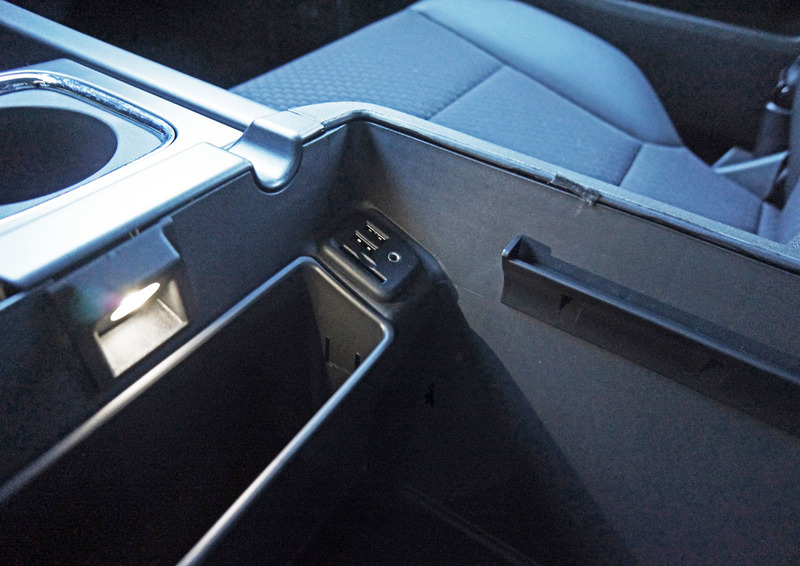 There’s even a special spot for your phone, plus power cord management and hanging file folder capability. 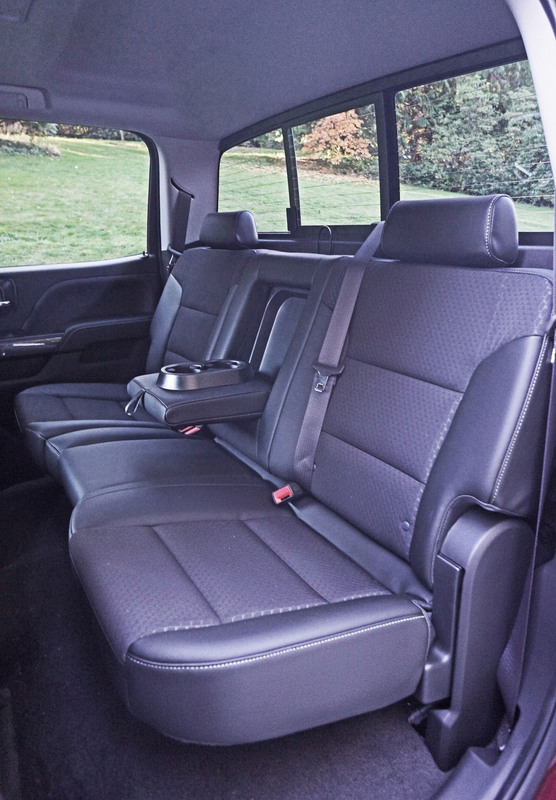 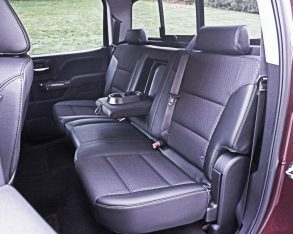 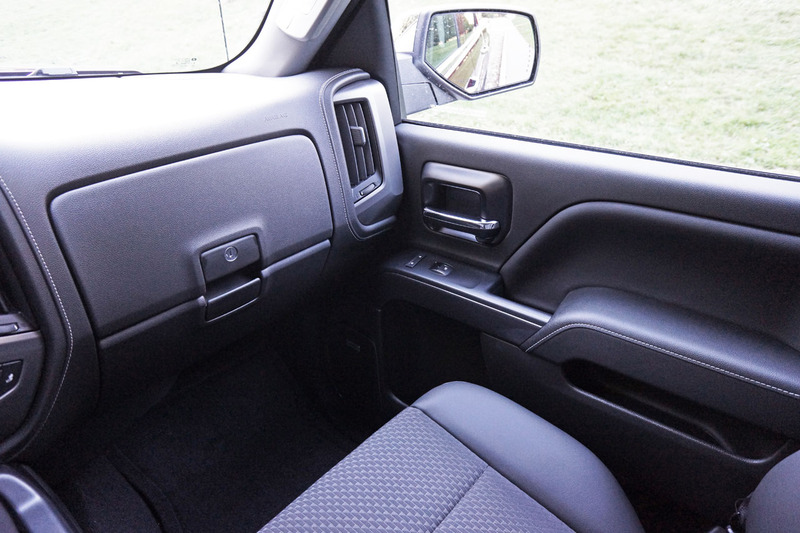 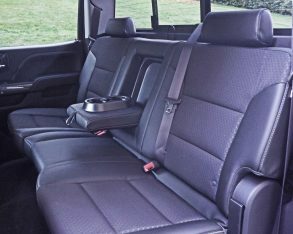 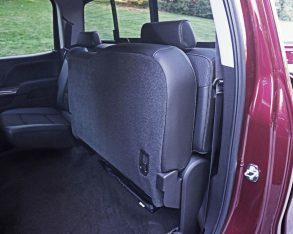 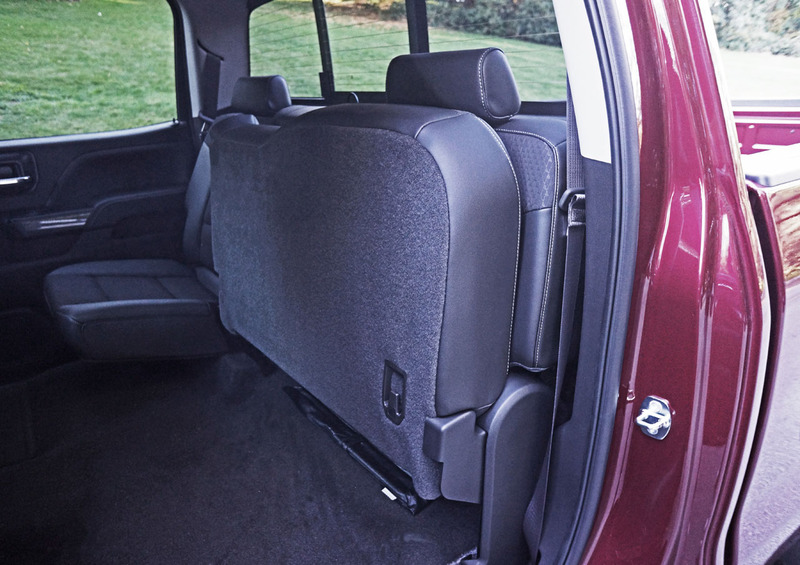 And now that we’re talking seats and storage, the Crew Cab’s standard rear bench is split in a 60/40 configuration while a handy underseat storage system can be added. 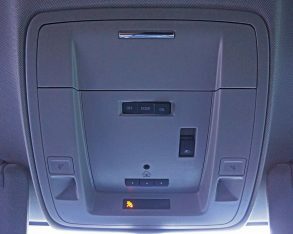 I’ve had this in previous testers and it’s a useful upgrade that’s accessible when you flip the bottom seat cushions upward against the cab wall. 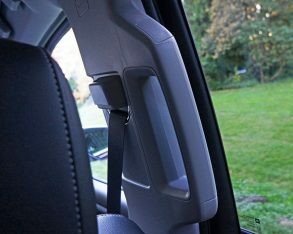 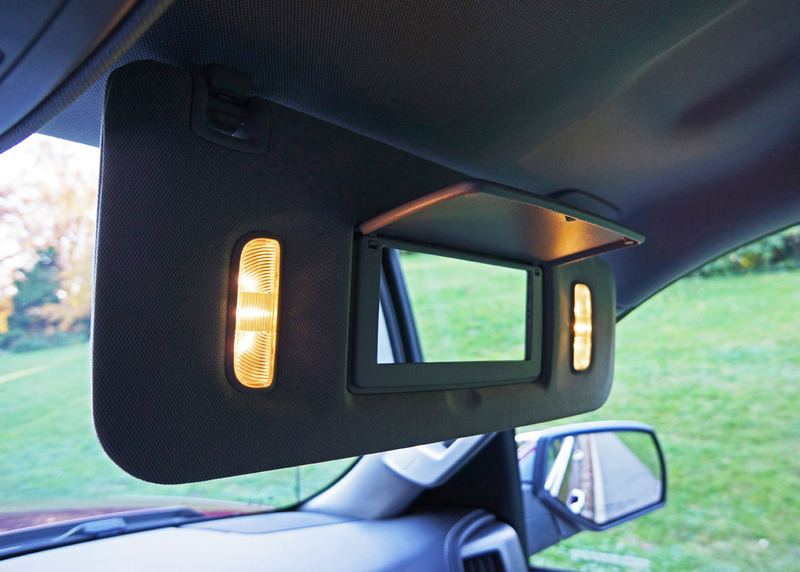 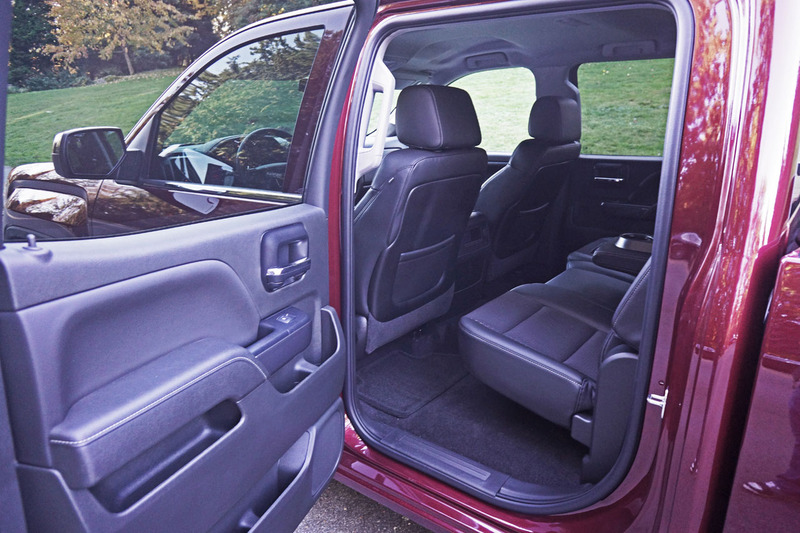 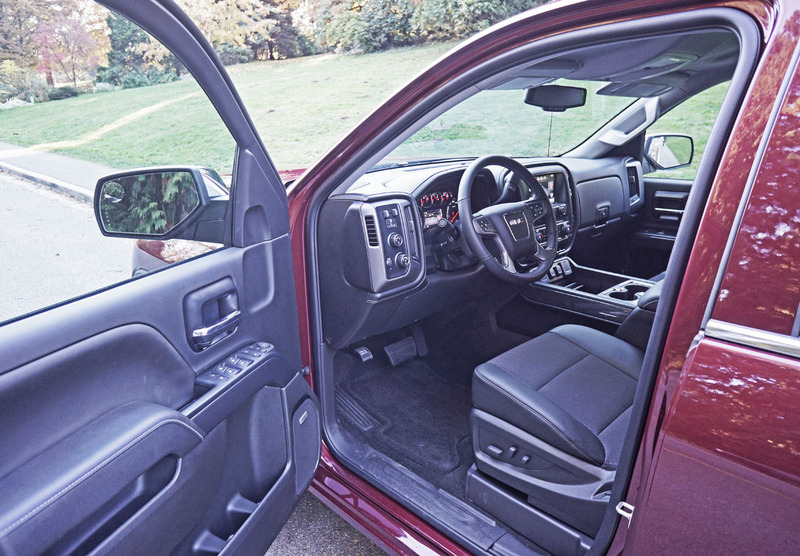 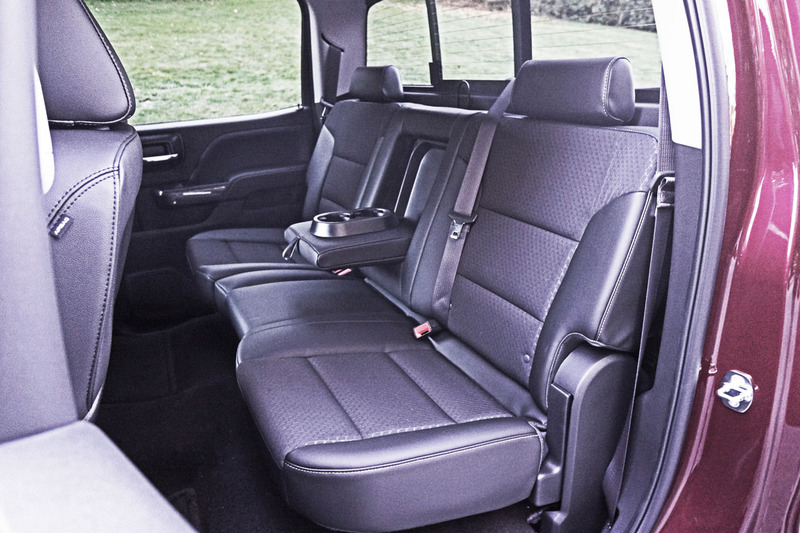 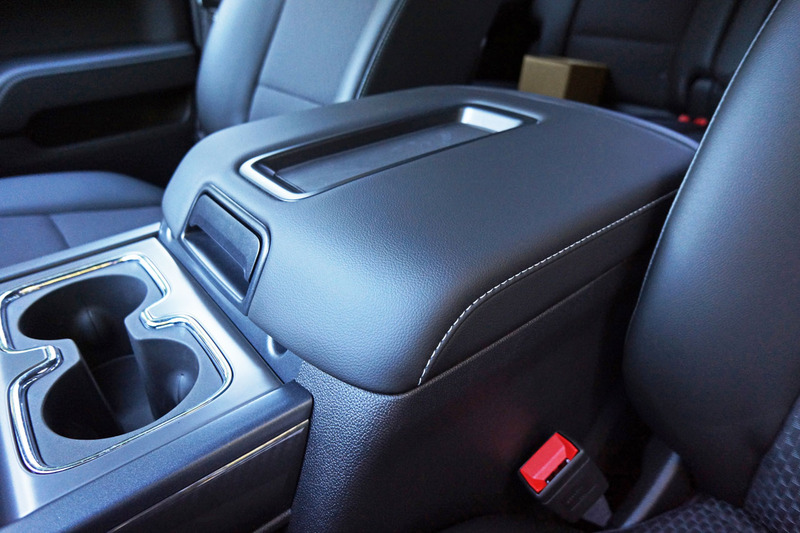 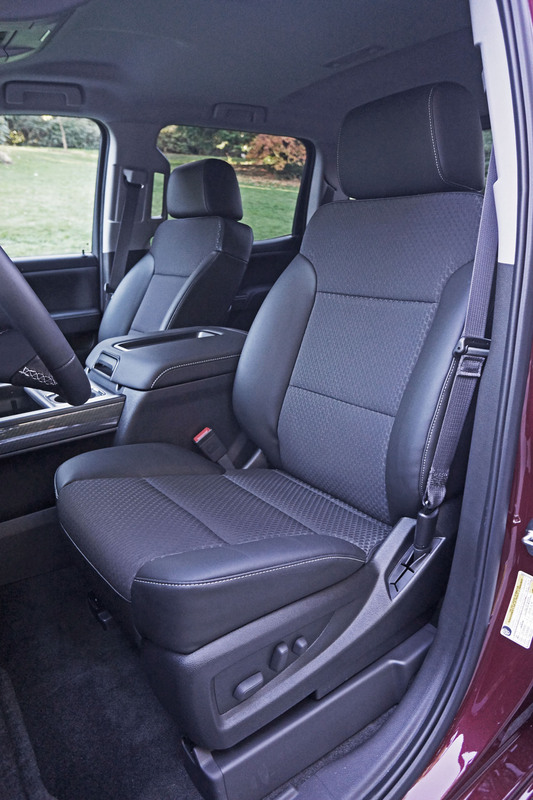 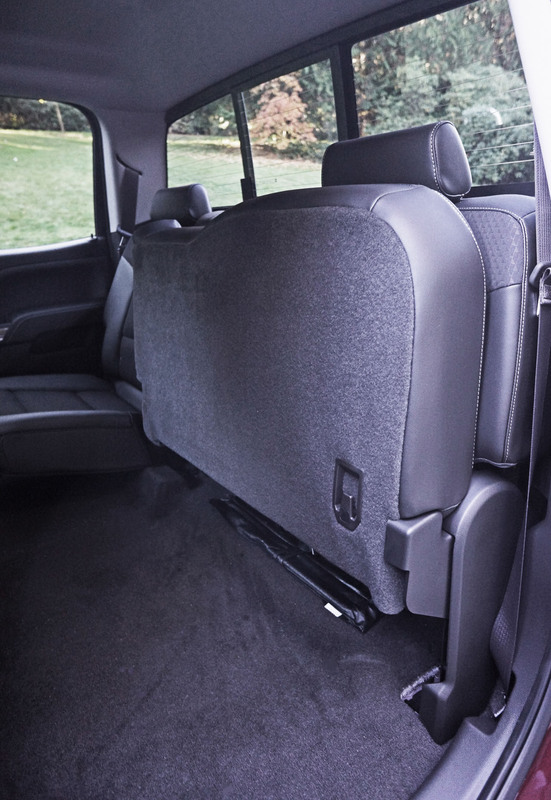 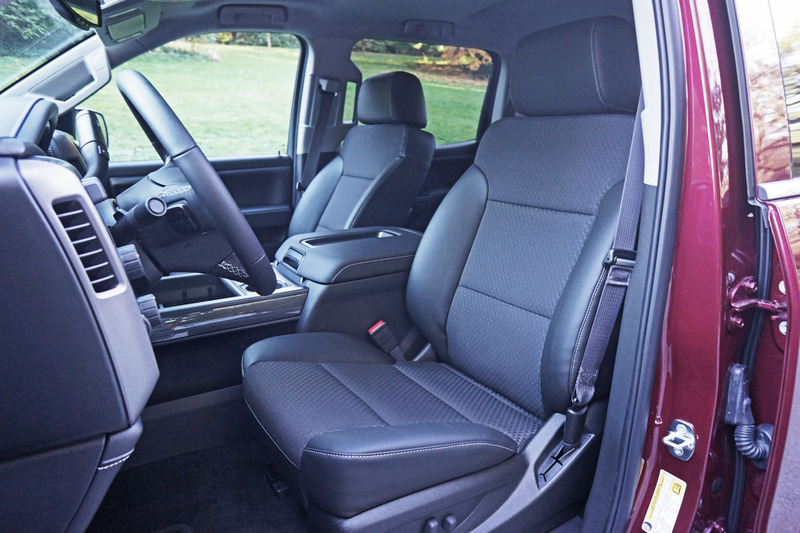 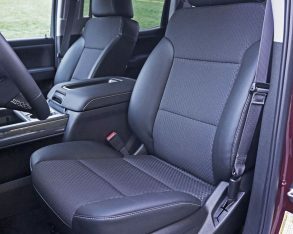 Alternatively, the standard Crew Cab setup leaves ample stowage space for keeping larger items safe, secure and dry when the rear seats aren’t in use. 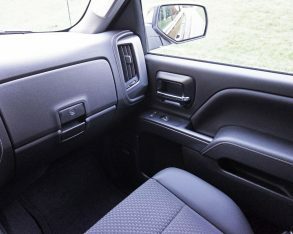 front, deep tinted glass around the back, an EZ-Lift and Lower locking tailgate, four moveable cargo box tie-downs, recovery hooks front and back, a full-size spare tire underneath the cargo bed, manual folding powered and heated side mirrors with an integrated driver’s side spotter mirror, a tilt-adjustable leather-wrapped multifunction steering wheel, cruise control, Bluetooth hands-free phone connectivity, powered windows with express up/down for the driver and express down for all others, illuminated vanity mirrors, and six-speaker audio accessible via the aforementioned infotainment system that also features Pandora internet radio, a backup camera, and voice activation. 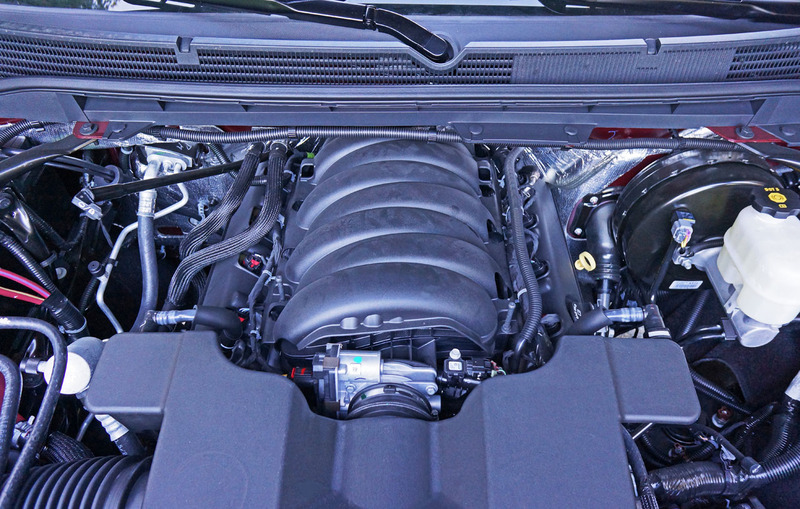 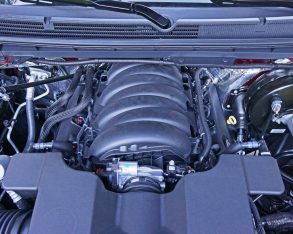 V6 featuring direct-injection, variable valve timing and GM’s Active Fuel Management cylinder deactivation system, good for a responsive 285 horsepower and 305 lb-ft of torque and impressive fuel economy rating of 13.4 L/100km in the city, 9.9 on the highway and 11.9 combined in 2WD or 14.1 city, 10.6 highway, or 12.5 combined with the part-time 4×4 system. 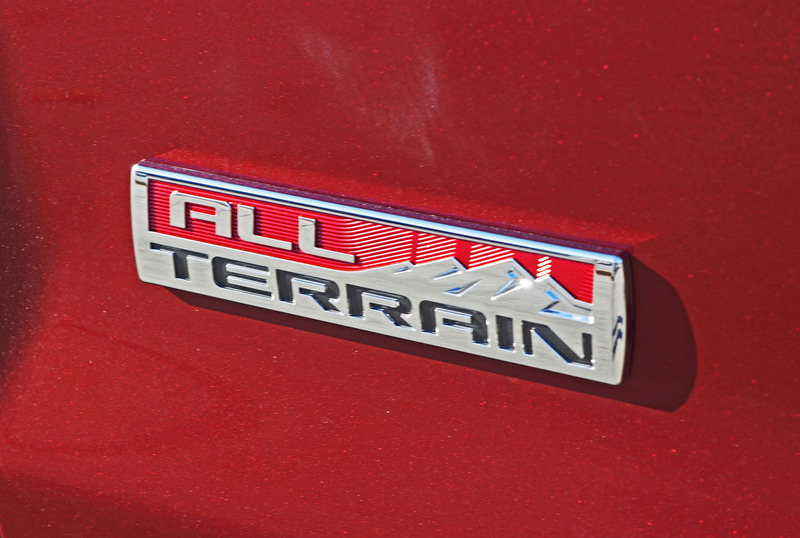 14.6 L/100km city, 10.3 highway and 12.7 combined in 2WD or 14.9 city, 10.7 highway or 13.0 combined in 4WD guise. 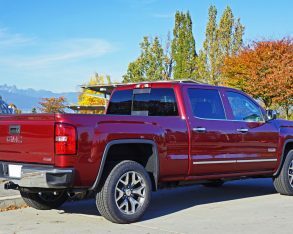 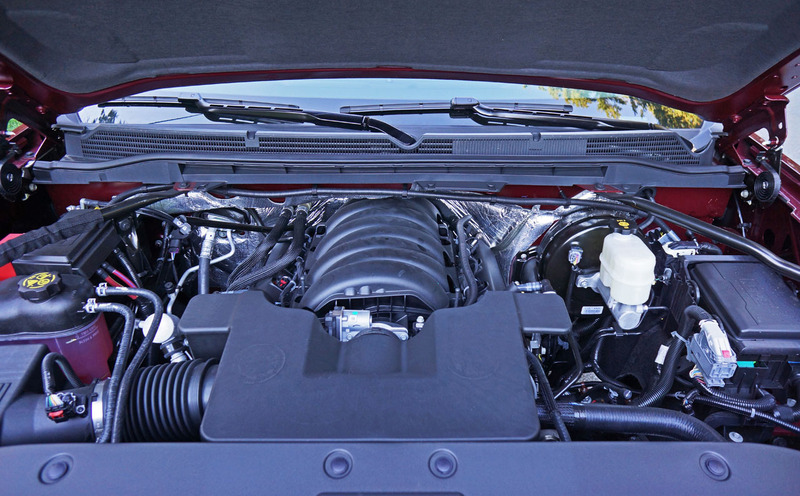 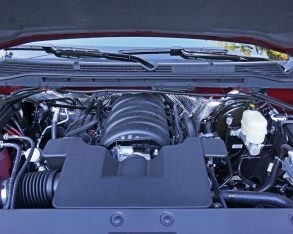 Heavy loads in mind, GM’s 420 horsepower 6.2-litre EcoTec V8 with 460 lb-ft of torque can only be had in SLT trim and above, which also relegates its state-of-the-art eight-speed automatic transmission to trims above the SLE. 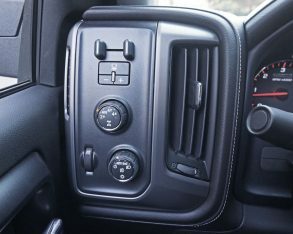 The standard six-speed automatic is very good, however, providing quick, smooth shifts and proven reliability, plus Tow/Haul mode, Cruise Grade Braking and Powertrain Grade Braking. 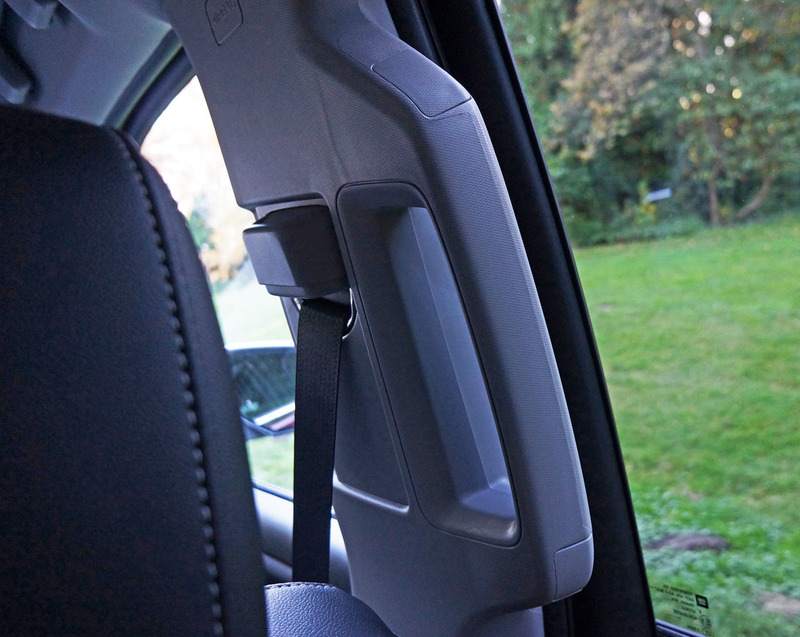 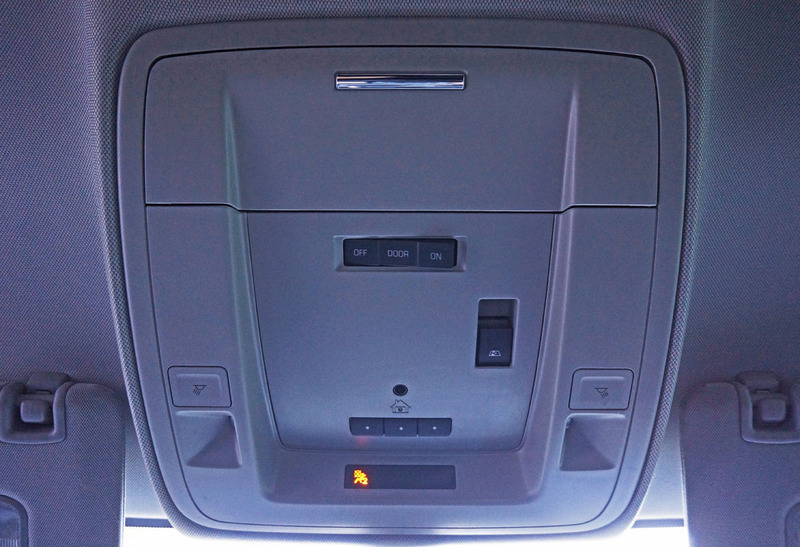 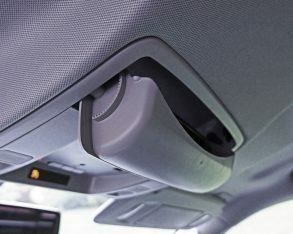 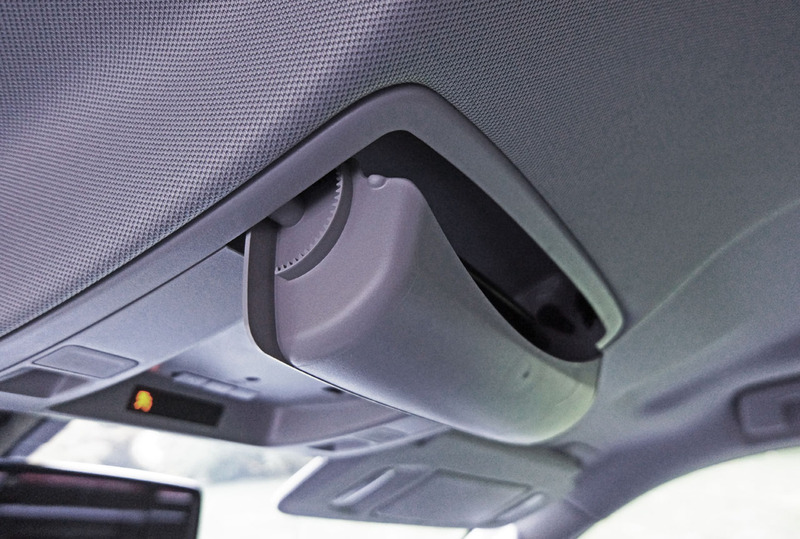 inclusion of premium-level seat-mounted side-impact airbags for the rear outboard seating positions. 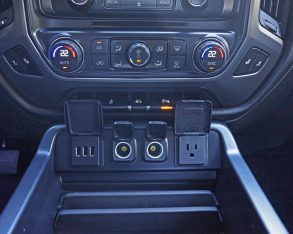 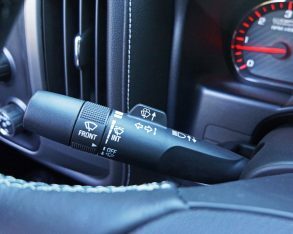 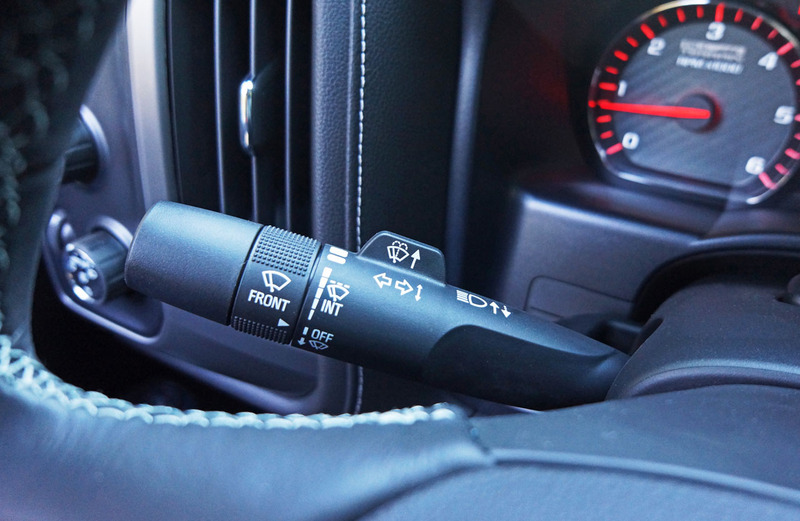 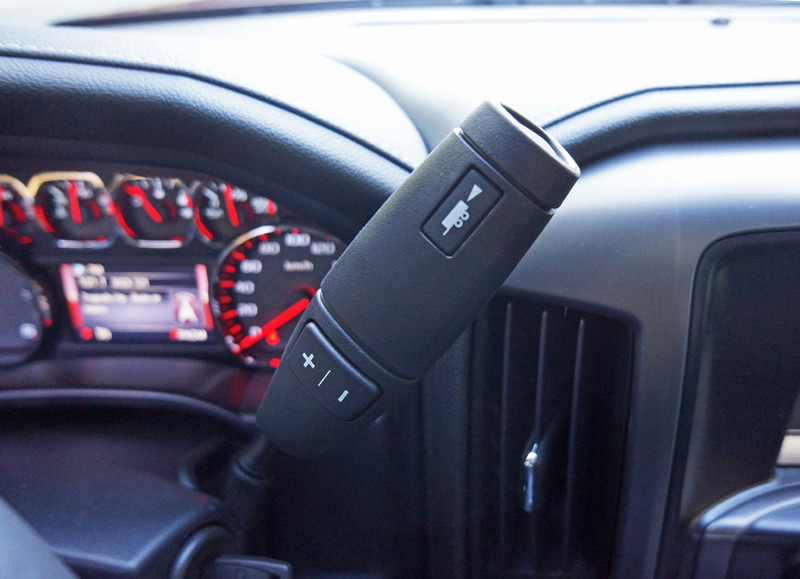 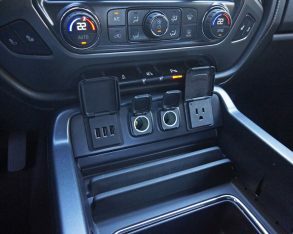 Switchgear to engage the two-speed Autotrac 4×4 system’s transfer case can be found to the left of the steering column just above an identically shaped and sized rotary knob for controlling the headlights, the former allowing easy actuation of two-wheel drive, Auto, four-wheel drive high or four-wheel drive low modes. 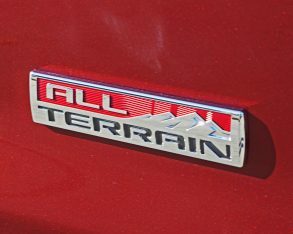 I didn’t take this particular truck off-roading, although by previous experience have found Sierra 4x4s excellent when pavement ends and trail begins, or for that matter complete lack of trail, and as mentioned my test truck came with the All-Terrain Package, a $2,980 option when configured on my tester incidentally, so its capabilities only increase over the base Crew Cab SLE 4×4. 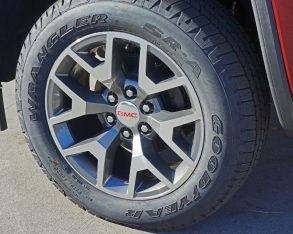 in mind, my tester’s V8 engine upped its window sticker by $1,125 while those 20-inch alloys I spoke of earlier added a very reasonable $770 to the bill, plus $250 for the larger tires. 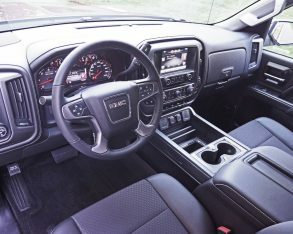 Some extras not yet covered include an engine block heater at $100; an integrated trailer brake controller at $300; a $1,095 SLE Convenience Package that includes the aforementioned power adjustable pedals and rear park assist plus a sliding rear window with a defogger; and a $2,260 SLE Premium Package that adds the dual-zone automatic climate controls and 110-volt AC power outlet I mentioned before, plus telescopic steering to the standard tilt system, remote start, universal home remote, fog lamps and trailering equipment. 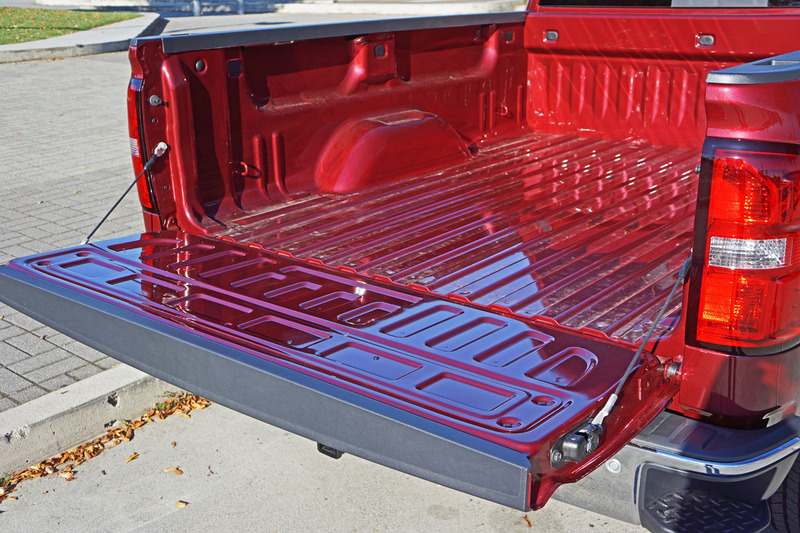 Red Metallic paint was a no-cost option; 10 additional colours and shades are available. 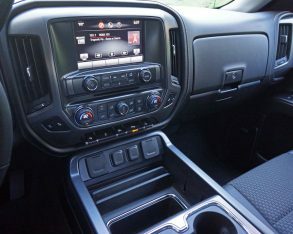 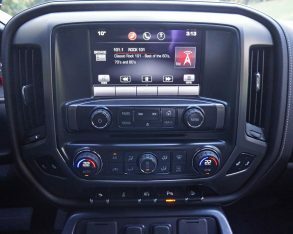 All of my truck’s options pushed the final tally just past $50k, still reasonable for such a nicely equipped full-size near-luxury truck, but by no means is my tester fully equipped even for its SLE trim. 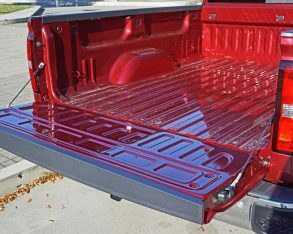 Loads of standalone options are still available, from mechanical upgrades like an automatic locking rear differential to hauling improvements such as a rubber bed liner, spray-on box and bed liner, cargo net, cargo rug, metal storage box, or multiple tonneau covers, from soft vinyl or vinyl with integrated support bows to a hard tri-folding tonneau with a vinyl cover. 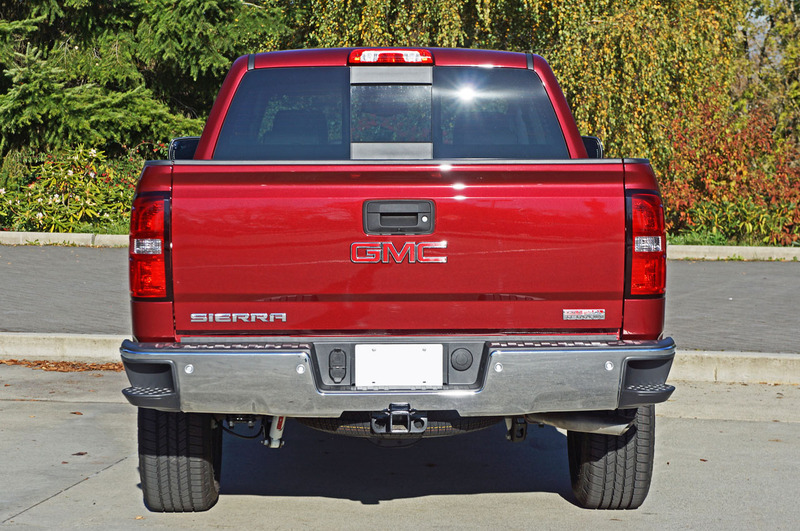 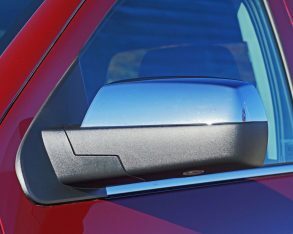 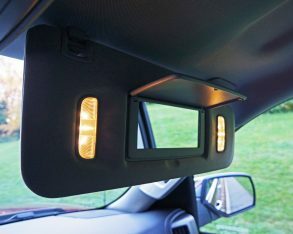 You can dress up your Sierra with numerous body-colour or chromed enhancements, upgrade the mirrors for style or towing, add side steps in various styles and trims, improve the functionality of the cabin with console inserts, one an expandable folder tote and another an organizer tray, while protecting everything inside with a theft deterrent system. 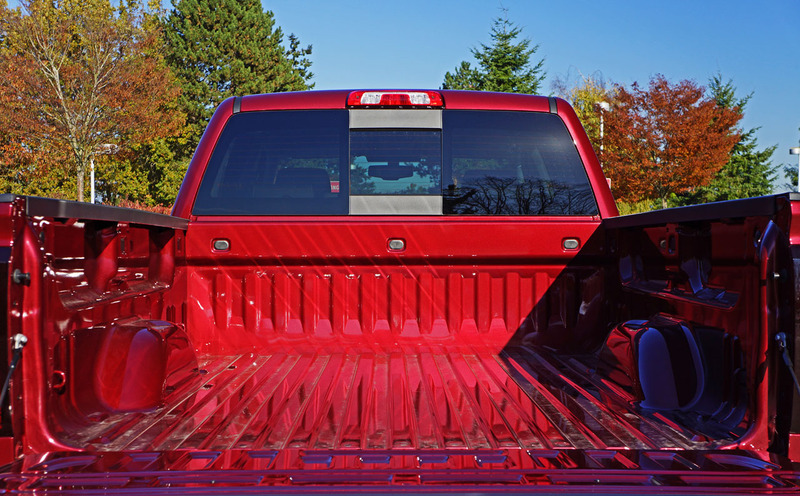 cab roof mounted lamp/beacon, high capacity air cleaner, underbody shield and heavy-duty front springs; and finally a Chrome Appearance Package for that big rig custom look. 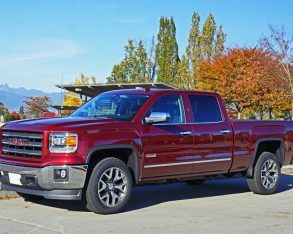 I’ve mentioned towing several times yet neglected to talk capability. 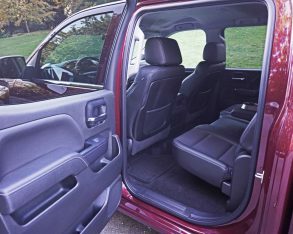 This said those needing to haul heavy loads can rest assured my tester’s 4,309-kilo (9,500-lb) capacity is more than adequate for most jobs. 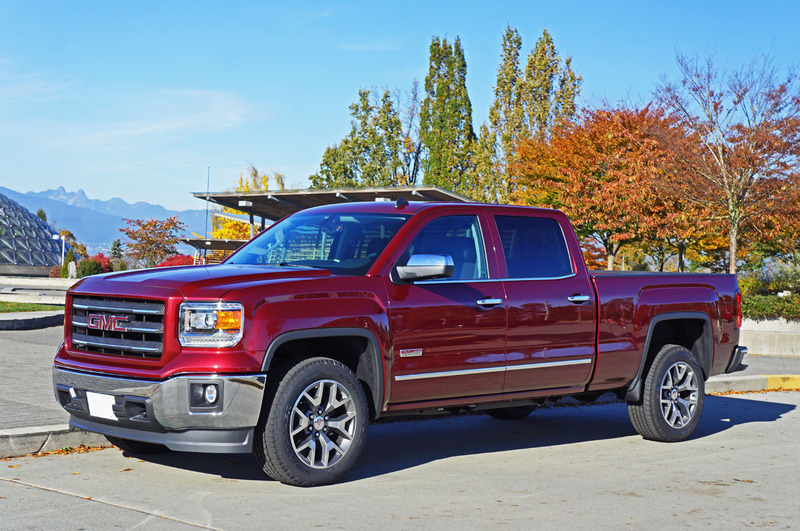 Depending on cab, box and 2WD/4WD drivetrain choice, the Sierra SLE with the 5.3-litre V8 is good for a minimum trailer weight of 3,946 kilos (8,700 lbs) and maximum of 4,445 kg (9,800 lbs). 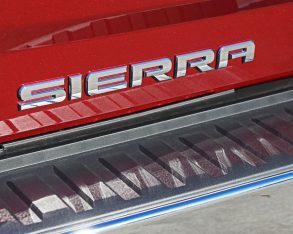 Likewise my tester’s 830-kg (1,830-lb) payload can manage tough work, although the Sierra you choose might only be capable of carrying 776 kilos (1,710 lbs) in its cargo box, or potentially up to 1,029 kg (2,270 lbs). 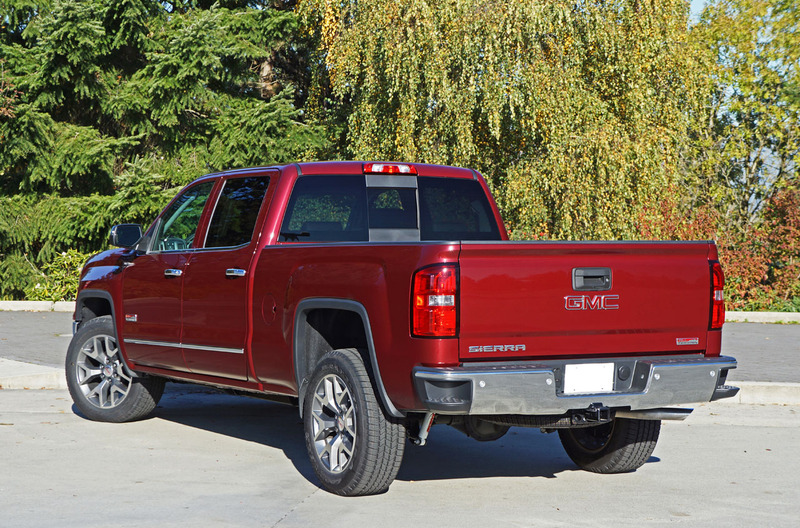 third in the Detroit Big 3 triumvirate (that is unless we’re talking brand to brand, where the Ram pickup line clearly outsells the Sierra in Canada and the U.S.). 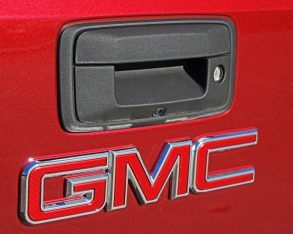 Of course, GMC likely doesn’t care all that much about selling the most half-ton pickup trucks in the segment, and I’m guessing neither do you. 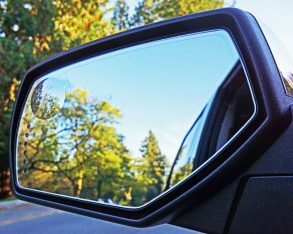 Sure they’d love to be number one, but these days it’s more about overall profitability than bragging rights, and of course long-term customer satisfaction. 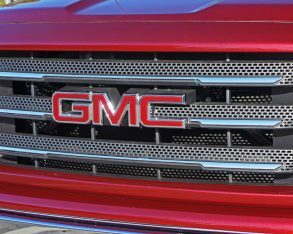 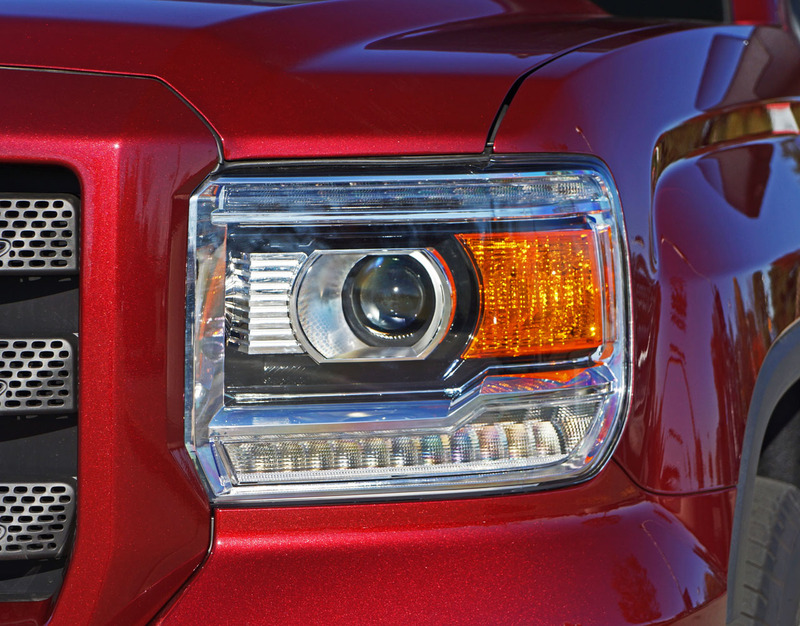 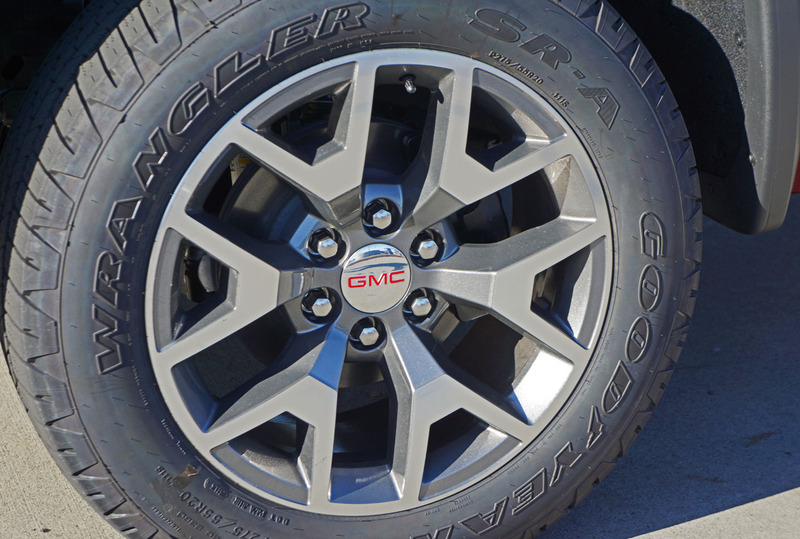 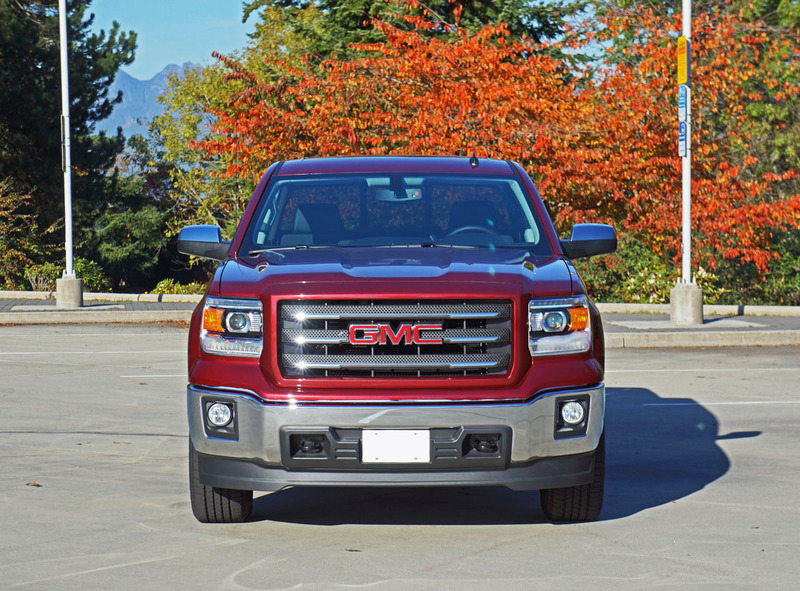 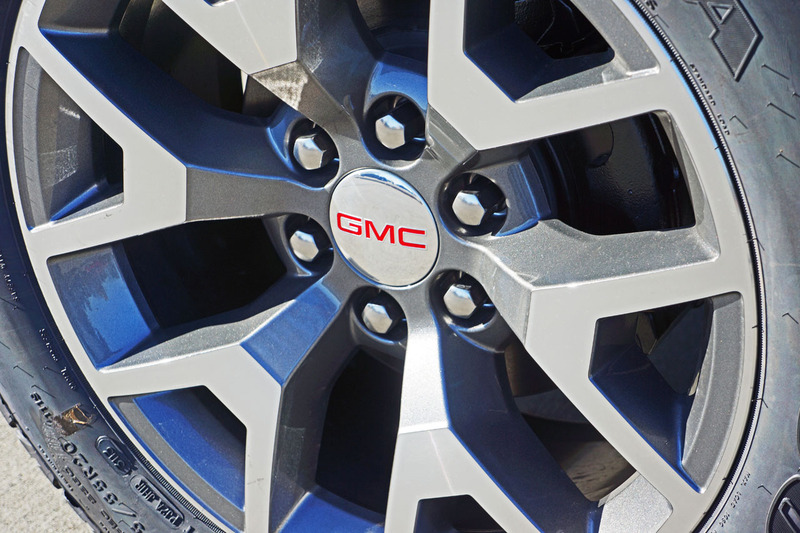 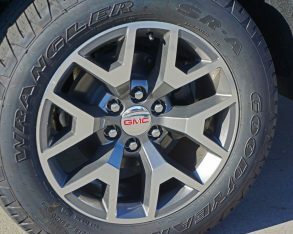 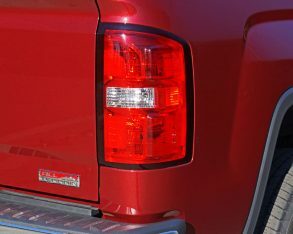 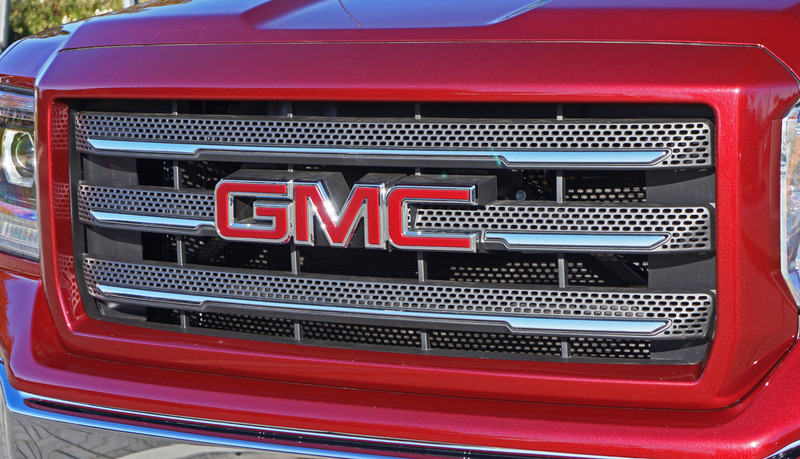 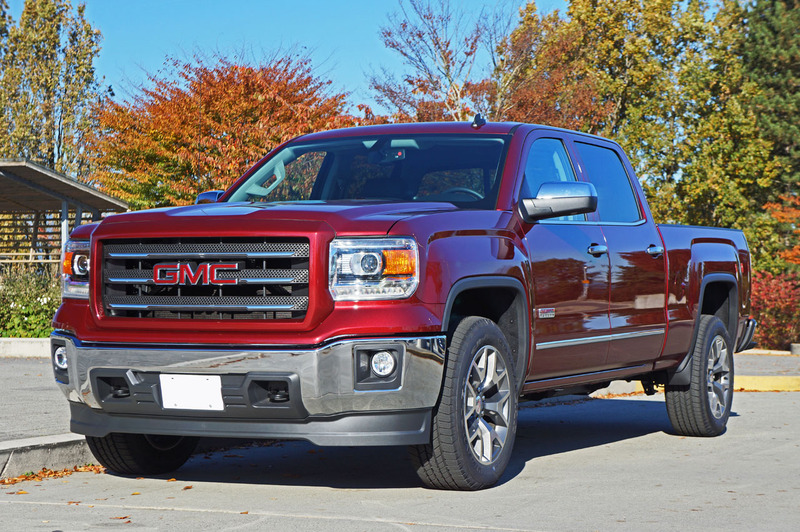 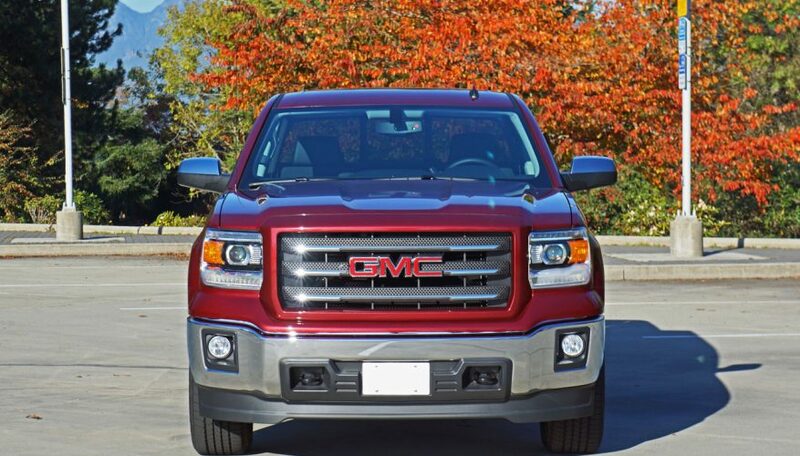 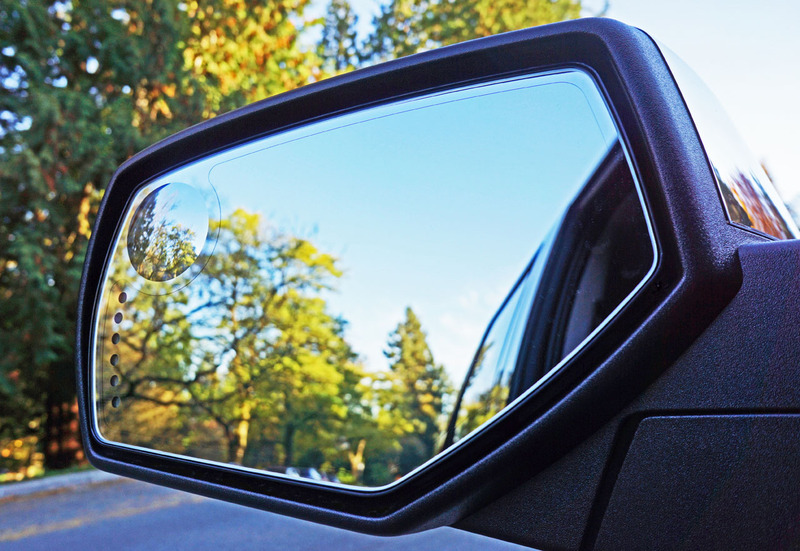 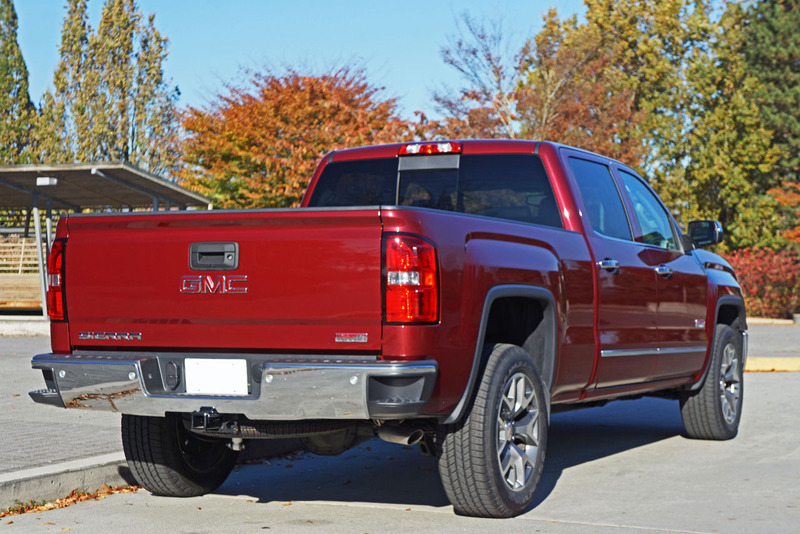 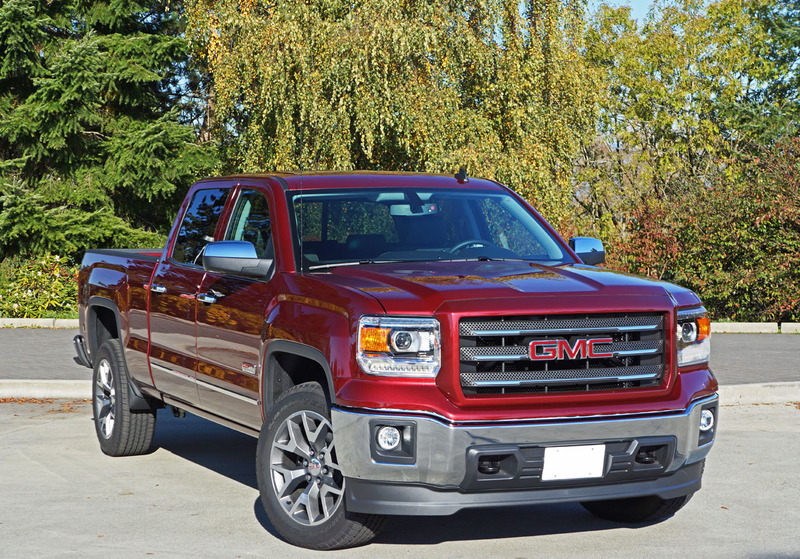 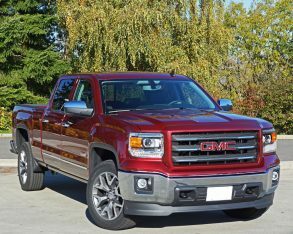 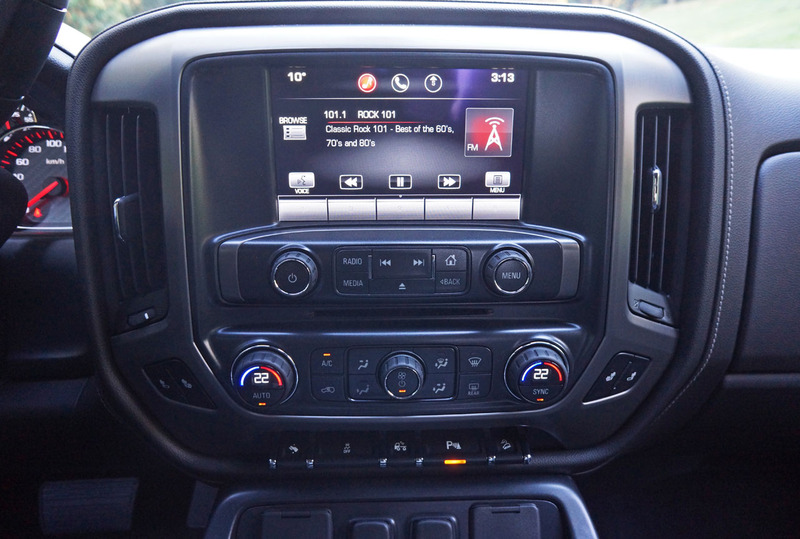 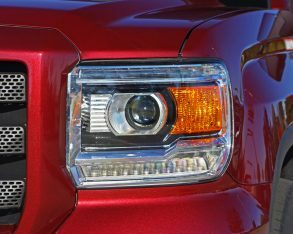 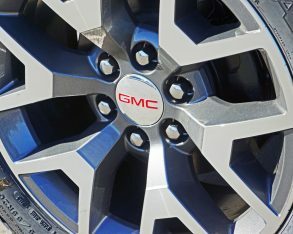 GMC has done well satisfying its leagues of faithful fans shown by the brand’s strong customer satisfaction ratings and top-10 ranking in the most recent 2015 J.D. 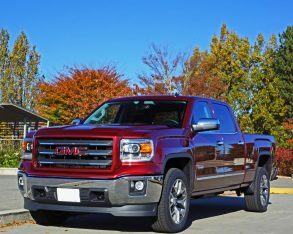 Power and Associates Vehicle Dependability Study, a reality that should improve as these customers replace their old trucks with this impressive new version. 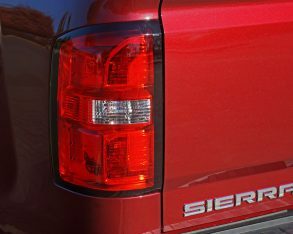 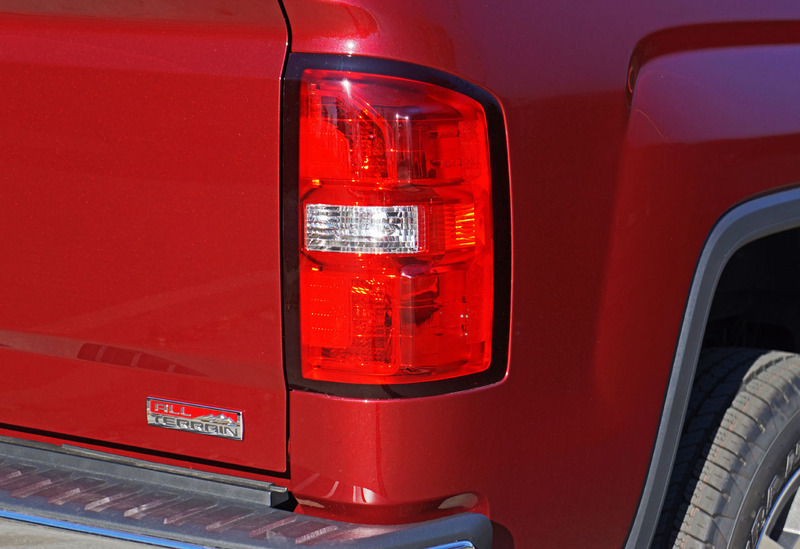 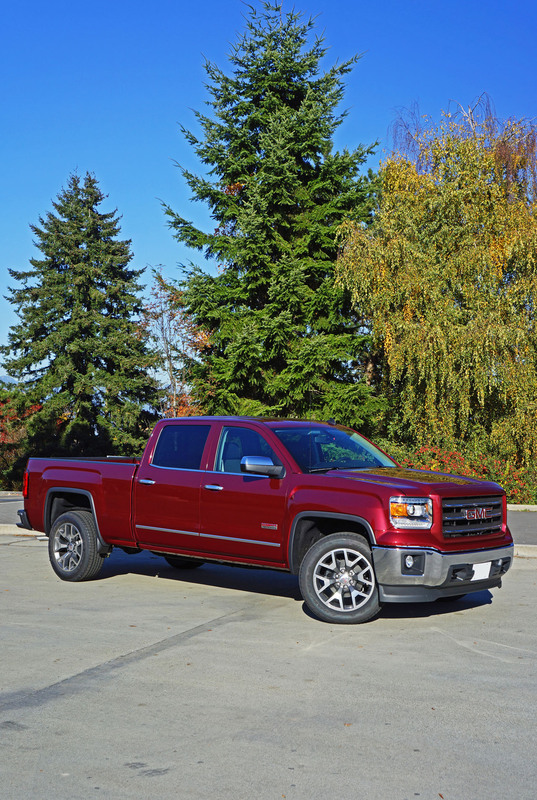 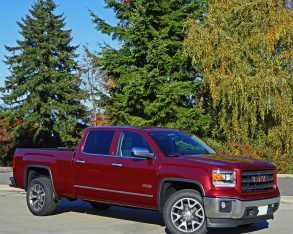 At least their loyalty will be rewarded, as the new Sierra 1500 is an excellent pickup truck.